New York | What Next? 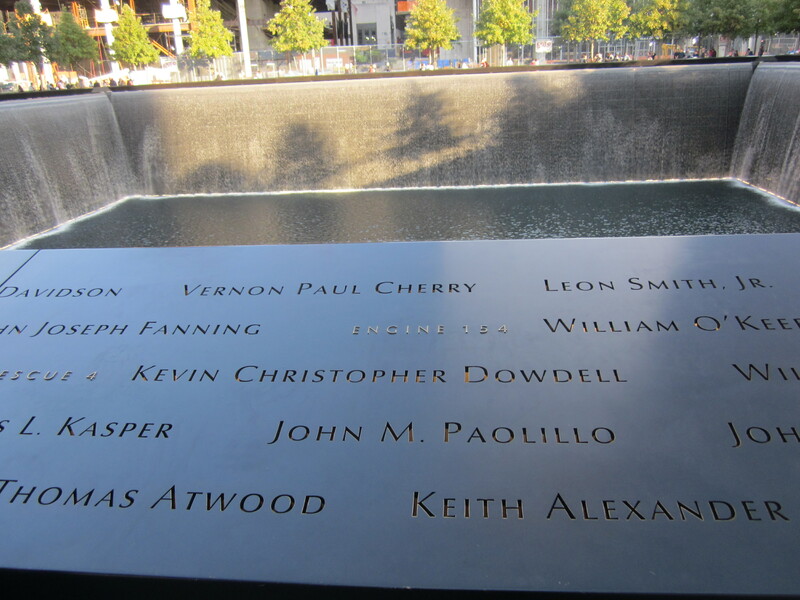 When we were in New York last fall we visited the 9/11 site and I took photographs of the names engraved on the steel bands that surround the reflecting pools in the memorial park. Since today is the anniversary of 9/11 I thought I would put faces and stories to three of those names. 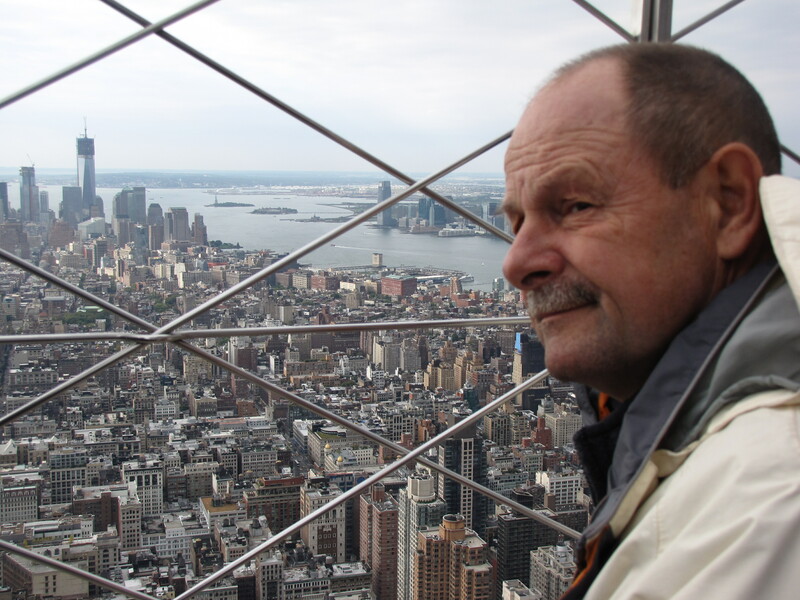 Michael John Otten was a 42-year-old third generation firefighter from Manhattan. He could always be counted on to lend a helping hand to those in his neighborhood who needed assistance. This coming January his 21-year-old son Christopher and his 18-year-old son Jonathan are scheduled to write their entrance exams for firefighting school so they can follow in their father’s footsteps. Their Mom says although she will worry for her sons’ safety she has no intention of stopping them. She remembers how their father loved his job and woke up everyday happy about going to work. She wants that kind of joy in their profession to be a reality for her sons too. Rhonda Sue Rasmussen was a 44-year-old civilian employee of the United States Army. 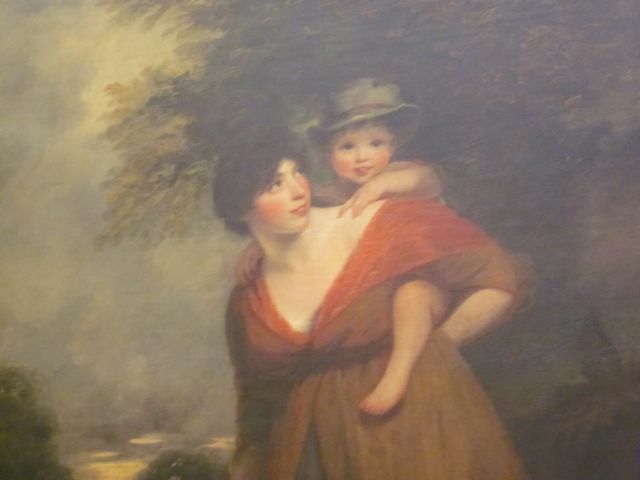 She and her husband Floyd had four children. He describes her as a woman with “a big heart, big smile, willing to listen, laugh at you, put you at ease.” Her work as a budget analyst had taken her family to several overseas postings including three terms in Germany which she had particularly enjoyed. 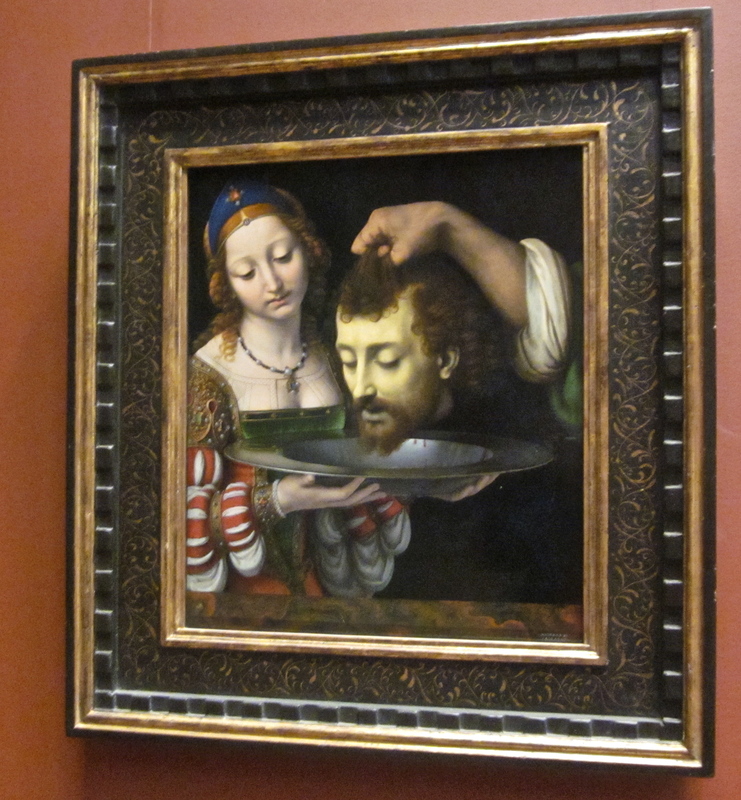 Rhonda loved to read aloud to her husband when they went on car trips. Amy R. King was a 29-year-old flight attendant on the plane that was flown into the South Tower. 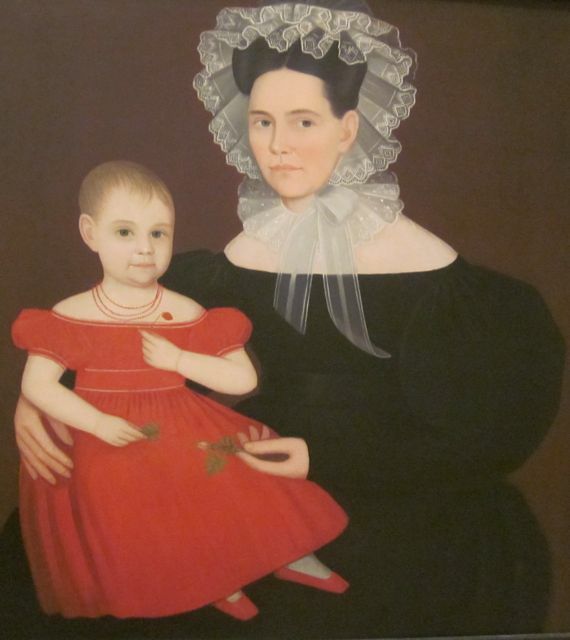 She was an avid runner, the youngest of three sisters and a devoted aunt to her nieces and nephews. She was dating Michael Tarrou a fellow flight attendant who died with her. Michael had recently asked his mother for his grandmother’s engagement ring to give to Amy. Her hometown of Jamestown New York will hold the 11th annual Amy’s Run this year. The 5K event was organized by Amy’s high school track coach and all proceeds go to summer camp scholarships for kids. The community has also built a playground called Amy’s Playce. It’s spelled with a ‘y’ because it is a place for kids to play and new equipment is constantly being added. 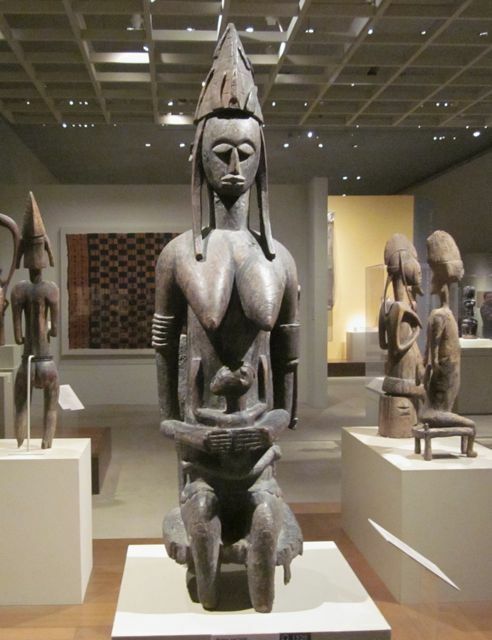 When we visited The Metropolitan Museum of Art in New York last fall I was overwhelmed! I knew I couldn’t possibly see or study everything in the short time we’d be there. I needed a theme! 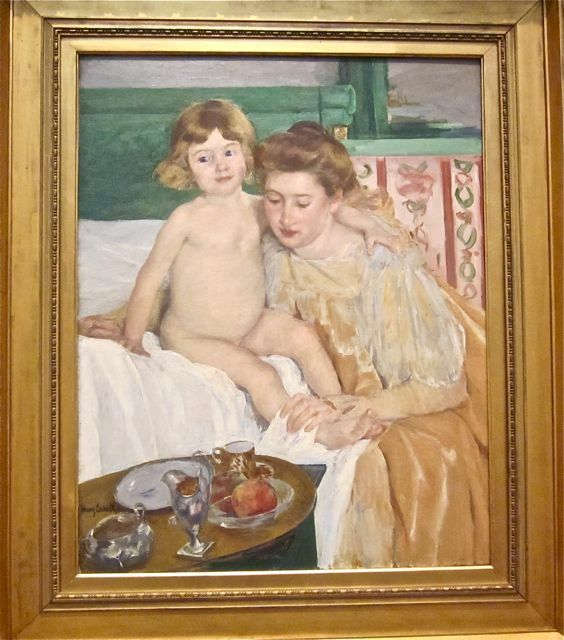 It didn’t take long before I realized I was being drawn to all the intriguing representations of motherhood. 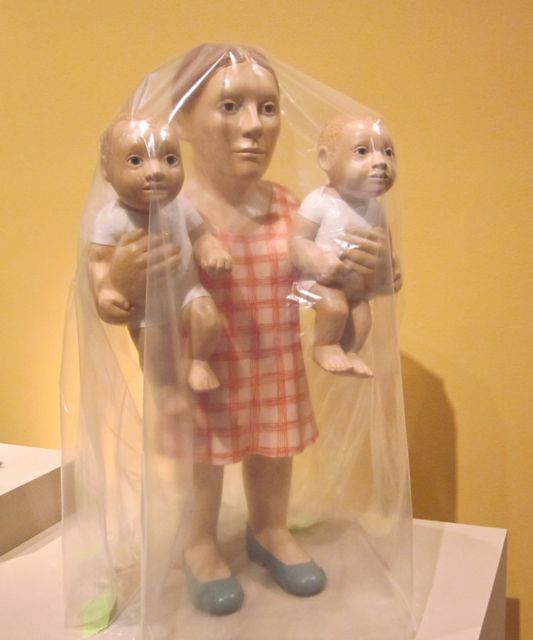 I decided to take photos of any piece of art that depicted motherhood in some way. Here are a selection of my favorites. Mothers are role models for their children. 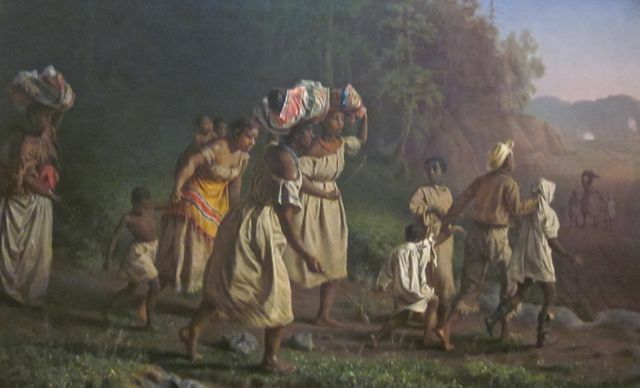 Mothers carry their children till they can walk on their own. Mothers create a home for their children. Mothers make their children feel beautiful. Mothers risk their lives for their children. 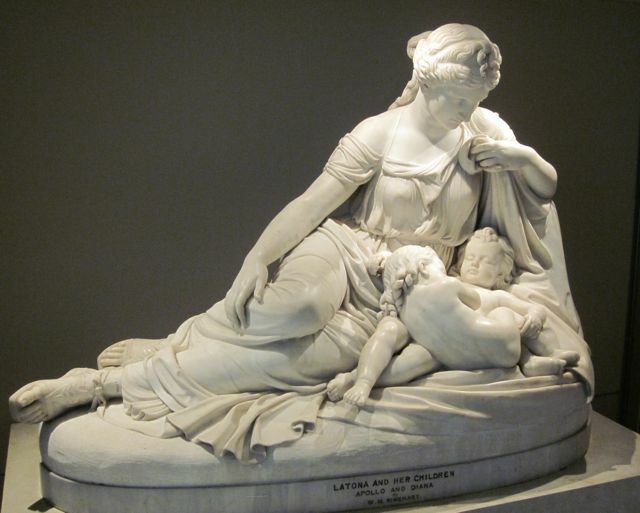 Mothers care tenderly for their children. 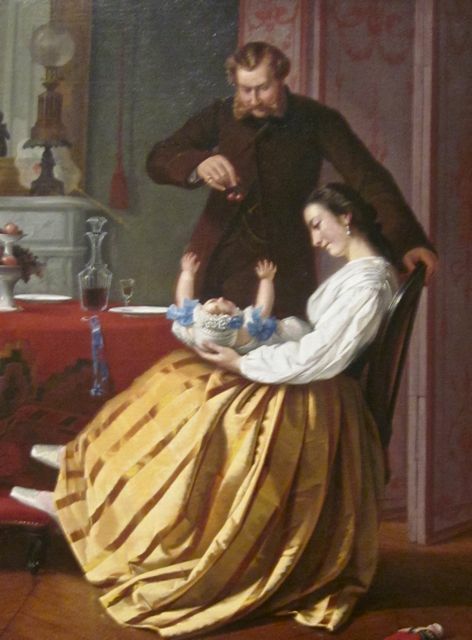 Mothers share their delight in their children with their partner. Mothers are their children’s protectors. 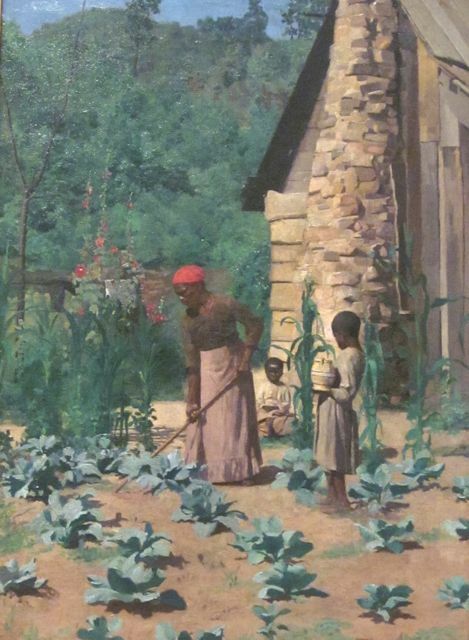 Mothers work to provide for their children. 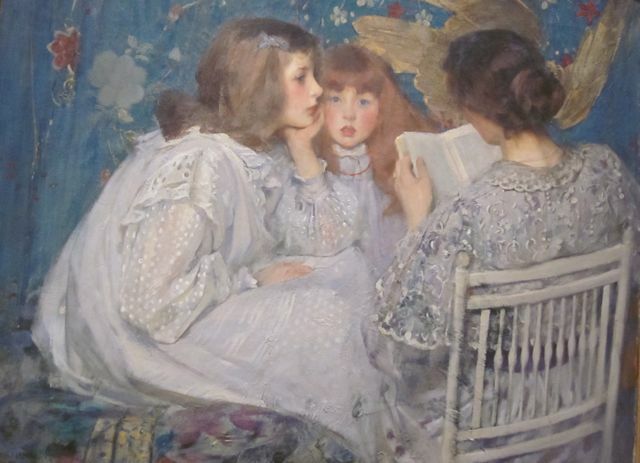 Mothers establish meaningful rituals in their children’s lives. 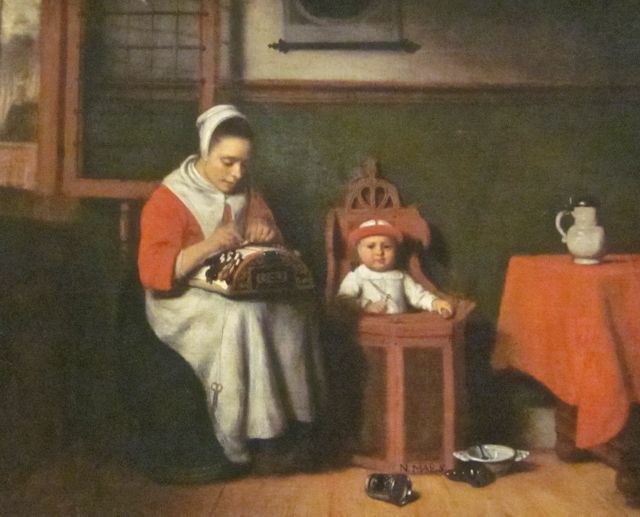 Mothers can do many things at once for their children. Mothers have enough love for all their children. 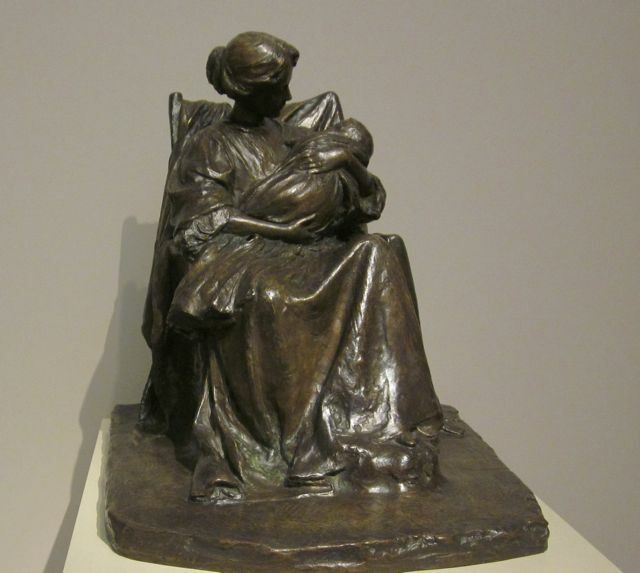 If you enjoyed this post you might also like………..
What Does Your Mother Do? 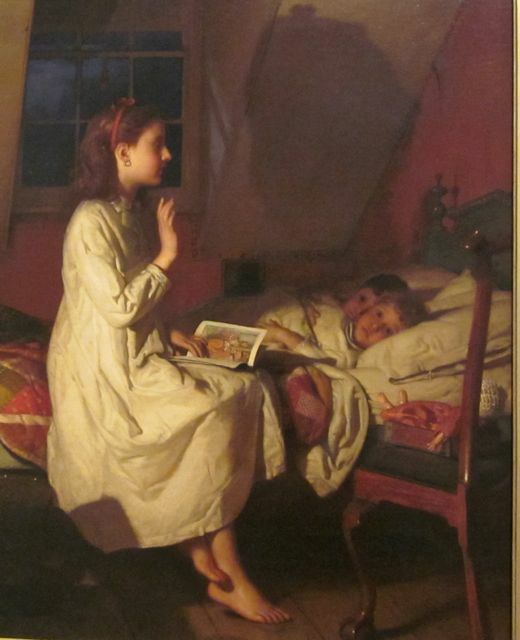 What Artwork Reminds You of Home? 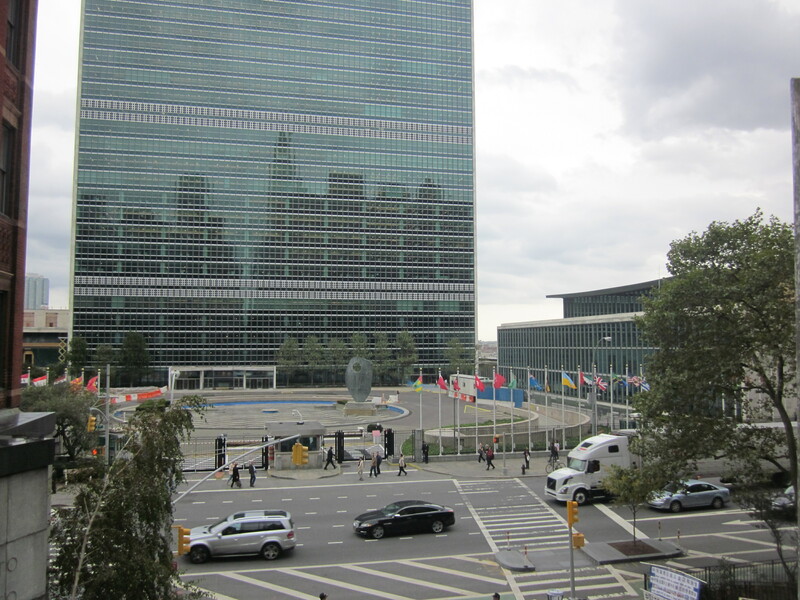 We took a tour of the United Nations and almost everything I saw was a connection to another place I’d been or something I had seen before. 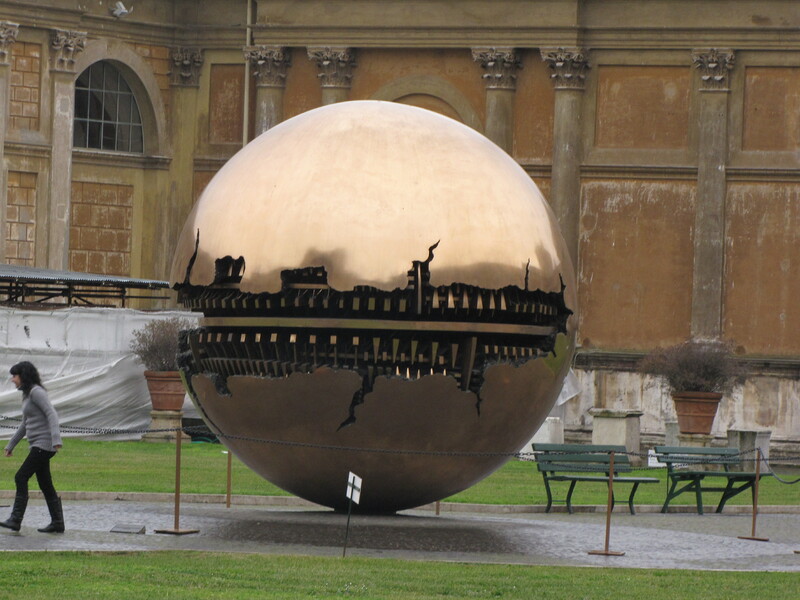 This sculpture called A Sphere Within A Sphere by Arnaldo Pomodoro was a gift to the United Nations by the country of Italy and sits in the courtyard just before you enter the UN. 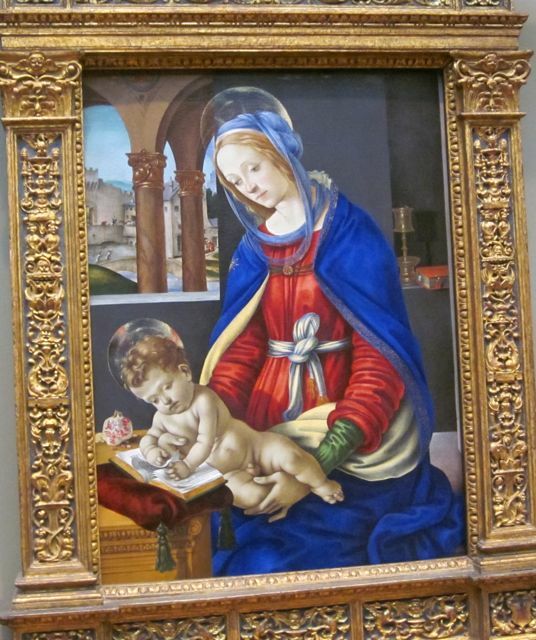 I took a photo of a very similar piece by the same artist when I visited the Vatican in Rome. To me the sculptures represent the world cracking apart enough for us to see it’s working interior. I think this gives us hope that it is possible to get the work done that we need to accomplish if we want to repair our fractured world. 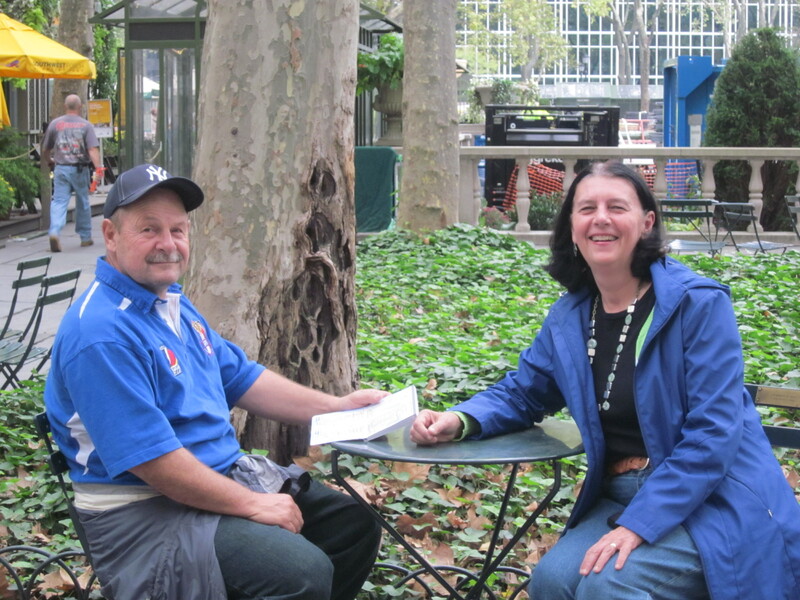 My husband Dave is chatting with a woman outside the United Nations who wanted people to sign a petition protesting the Chinese government taking over people’s land without giving them compensation for it. 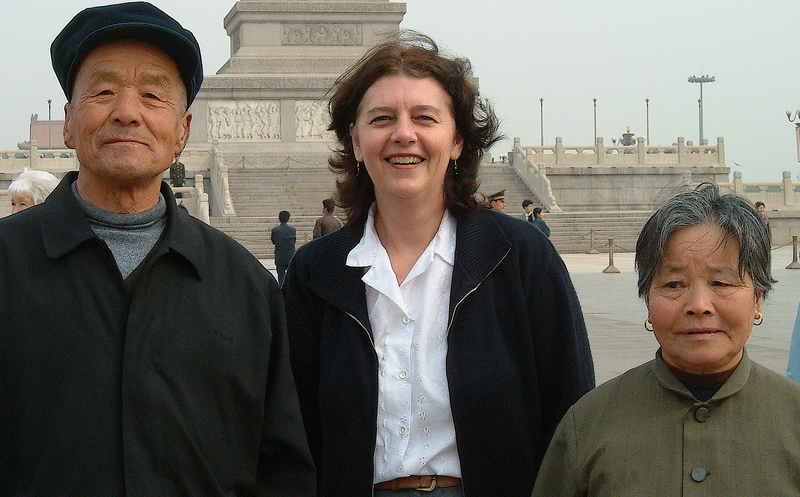 She reminded me of a woman from Hebei province I saw praying to Mao’s picture when I visited Tiananmen Square in Beijing. She said her family land had been confiscated without proper compensation and when her husband went to government officials to protest he was arrested. 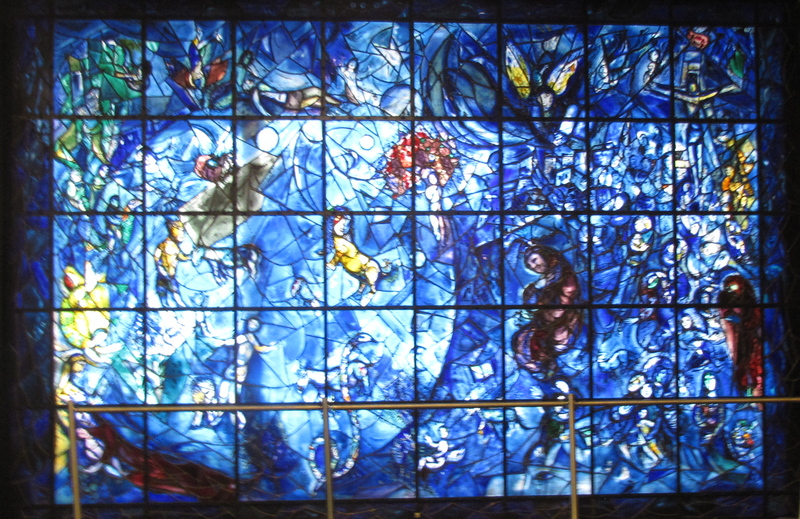 A stained glass window by Marc Chagall sits just outside the chapel at the United Nations. 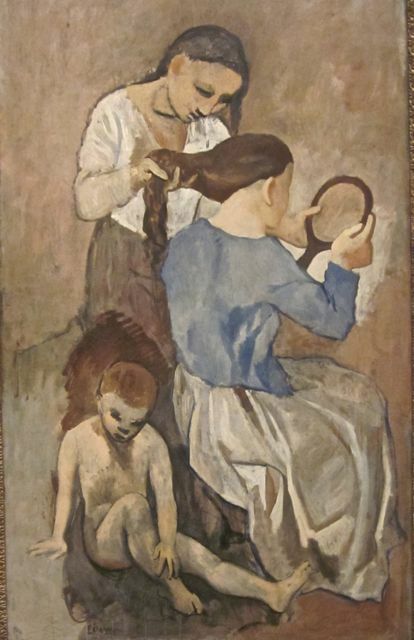 It was presented by United Nations staff members and Chagall as a memorial to Dag Hammarskjold, the second Secretary General of the United Nations who died in a plane crash in 1961. The window contains various symbols of peace and love. The musical notes in the window are a connection to Beethoven’s Ninth Symphony a favorite of Mr. Hammarskjold’s. 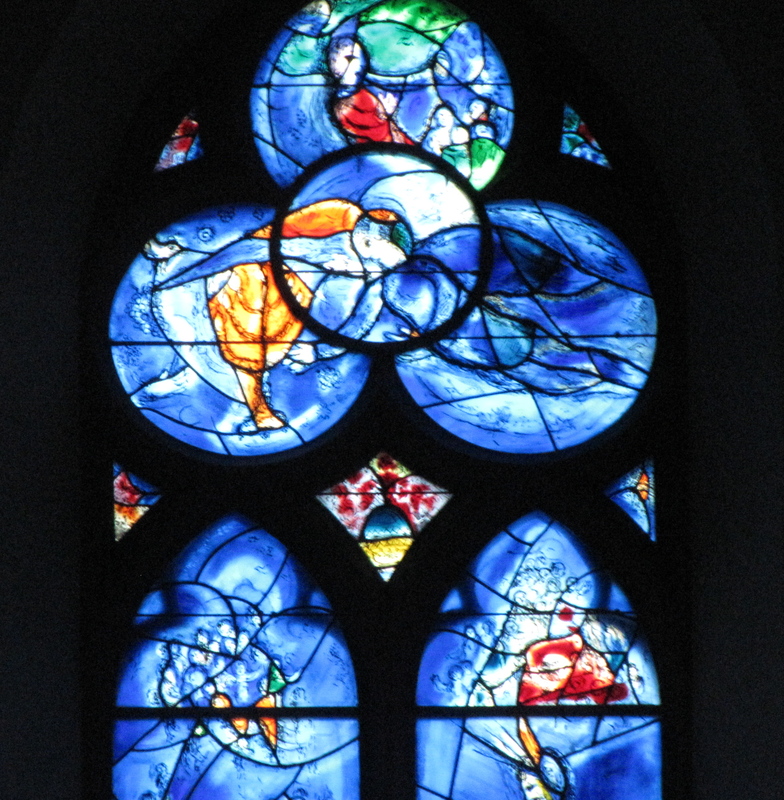 I took this photo of a Chagall window in Mainz, Germany. It is one of a series of windows in St. Stephen’s church. The windows depict scenes from the Old Testament. Chagall made them after World War II to help Jews and Christians to remember the part of their faith story they share. He hoped this would aid in the reconciliation between Jews and German Christians after the Holocaust. At the United Nations you can view a presentation about the need to eliminate nuclear weapons from our world. 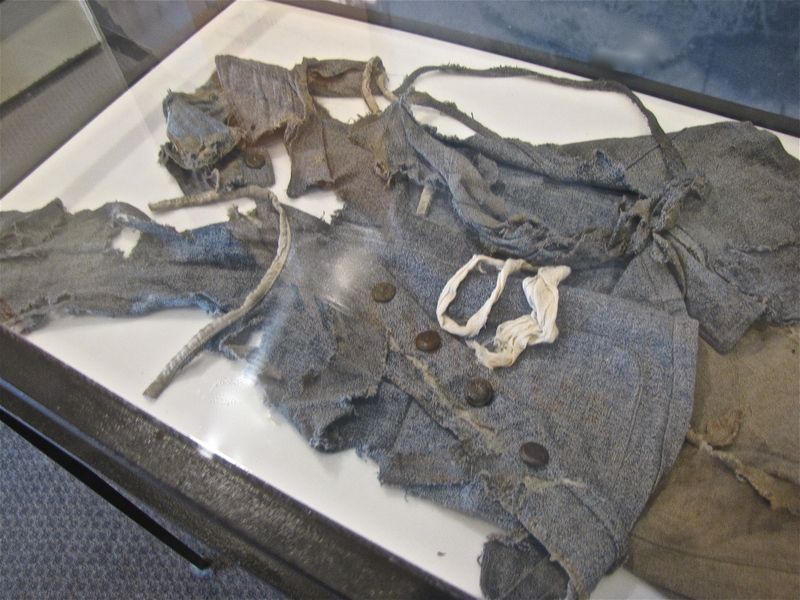 They have these clothes on display from a victim of the bombing of Hiroshima. 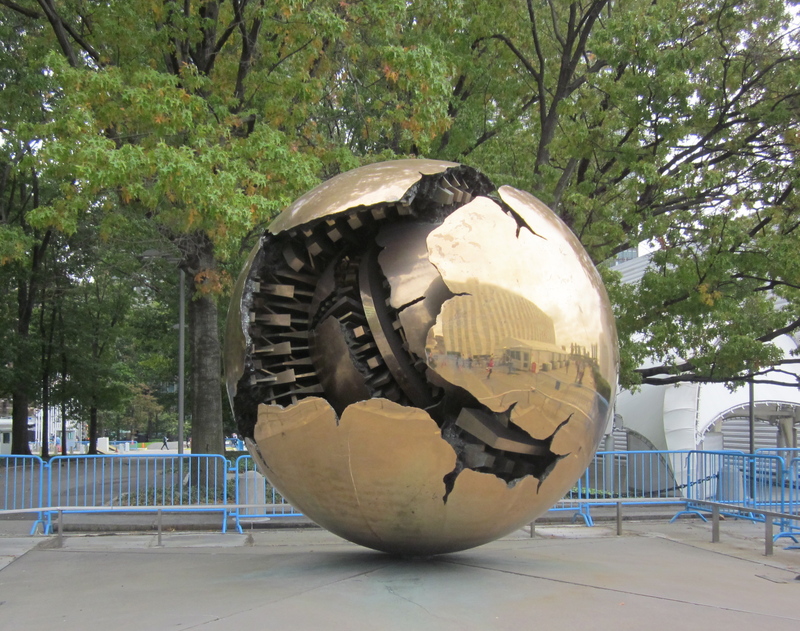 It is to remind United Nations visitors of the horrible impact of nuclear weapons. 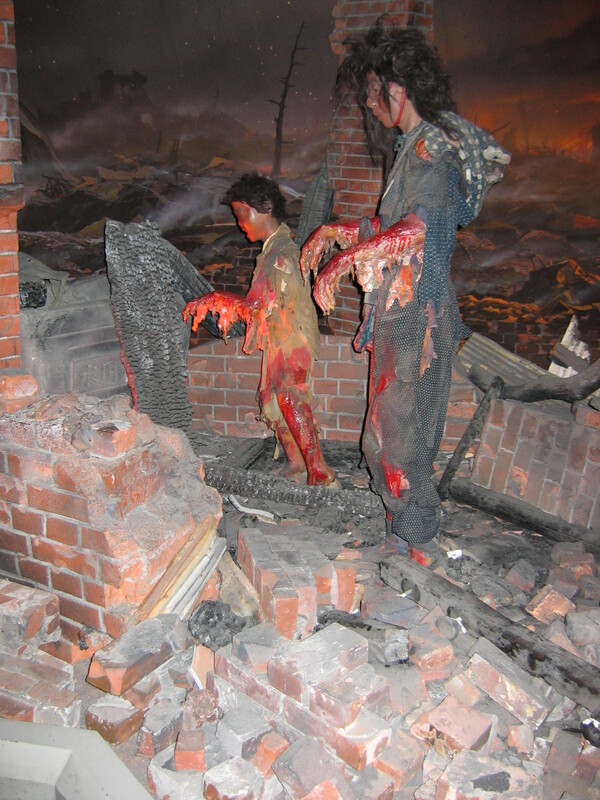 It brought to mind this photo I took in Hiroshima, Japan at the Peace Memorial Museum showing some of the victims immediately after the dropping of the bomb. 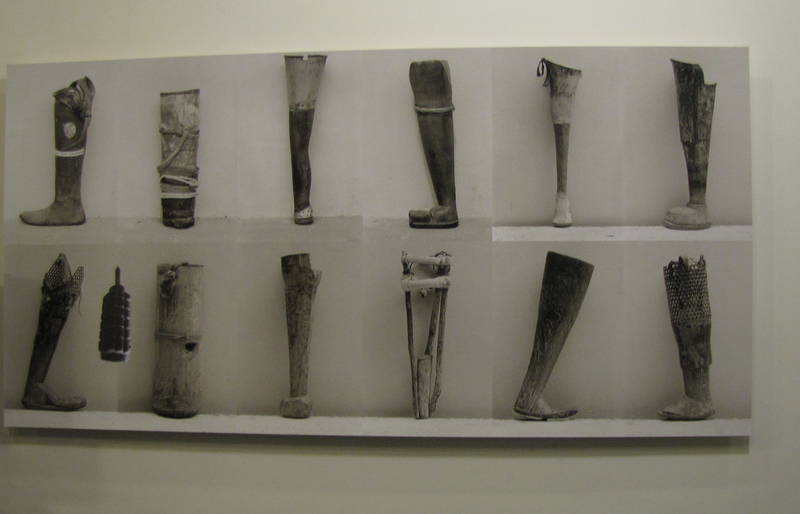 These are home-made prosthesis made for victims of land mines in Cambodia. The United Nations is part of a world-wide mission to eliminate landmines. According to this United Nations website land mines still kill 15,000-20,000 people a year. The United Nations display reminded me of my two visits to land mines museums in Cambodia. 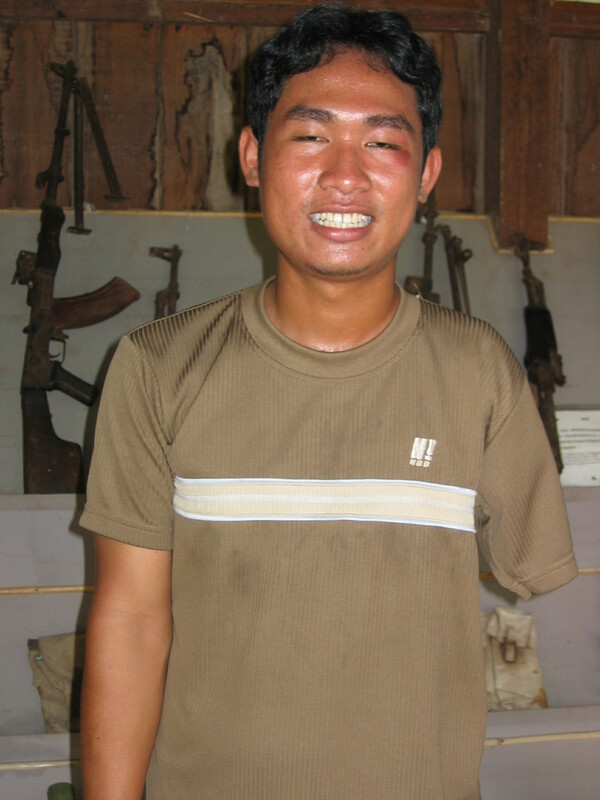 At one our guide had lost his arm to a land mine. 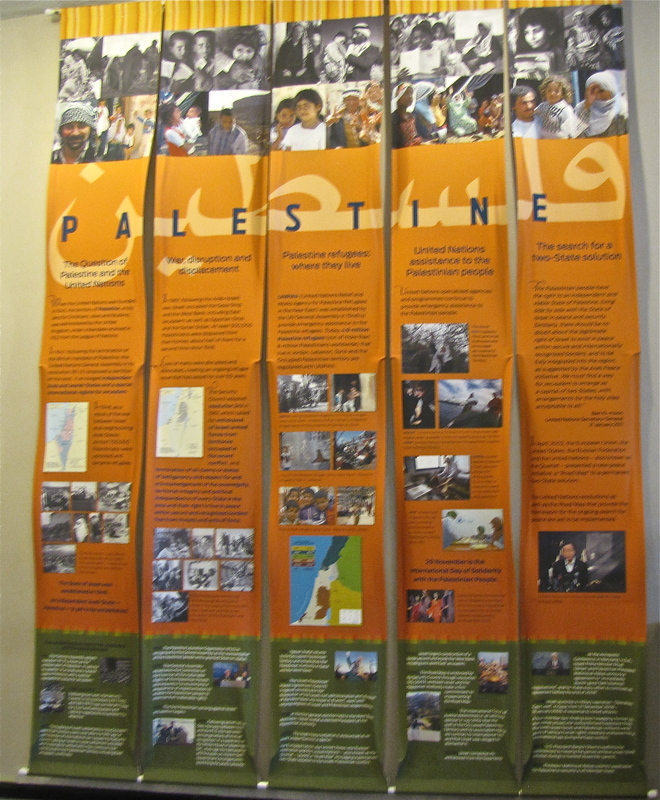 According to our guide the United Nations has been working on finding a solution to the question of Palestine since the first special session of the General Assembly in 1947. 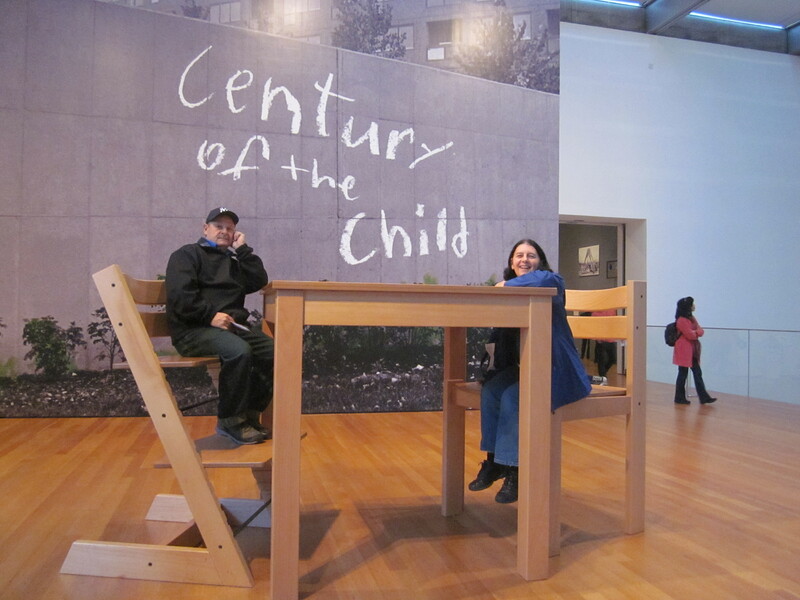 It reminded me of my visit to a Palestinian refugee camp with twenty-four of my students from Hong Kong. 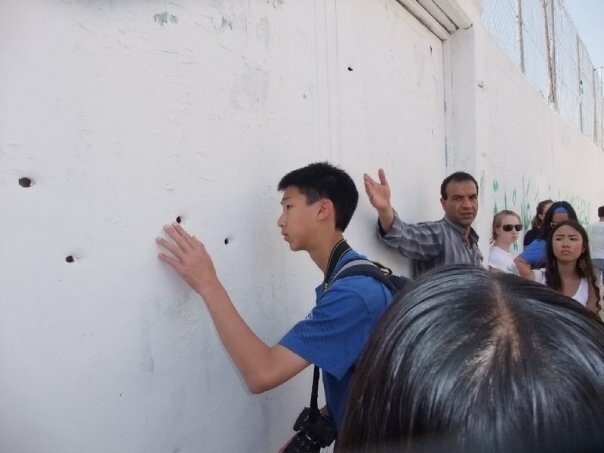 Here the guide shows us bullet holes in the wall around a soccer field where school children were playing. My husband Dave is listening to the audio description of a mural at the United Nations that depicts the nuclear accident at Chernobyl. 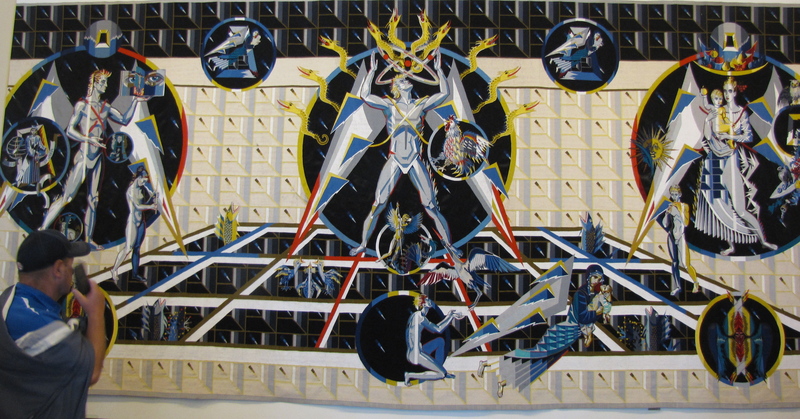 The mural reminded me of our visit to the Chernobyl Museum in Kiev, Ukraine. 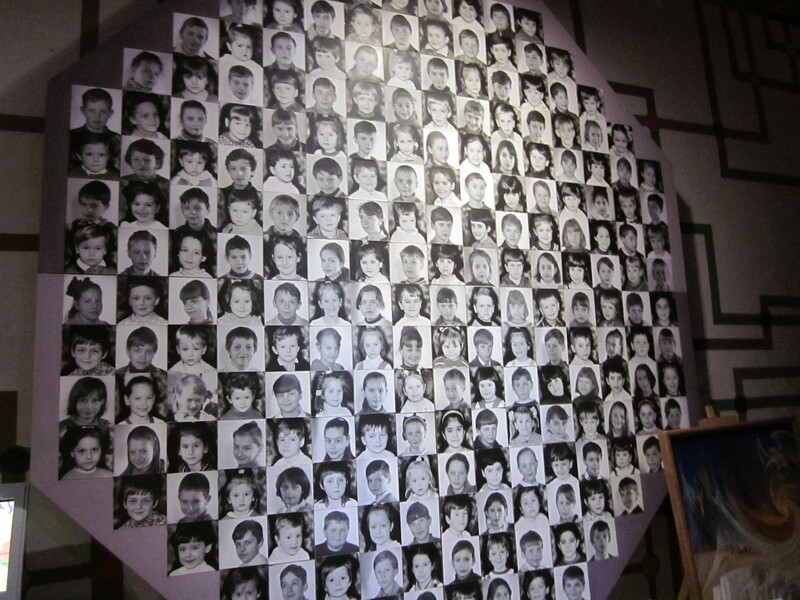 I took a picture of this photo collage which shows the faces of children who were victims of the disaster. Out of the 3 million people the Ukrainian government recognises as victims of Chernobyl, 642,000 are children. 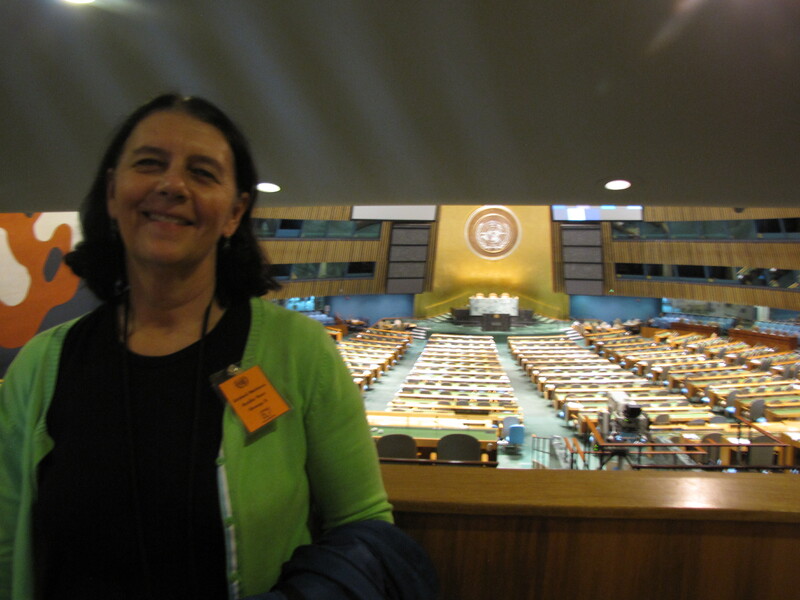 Our visit to the United Nations prompted me to make connections with many previous experiences we have had. 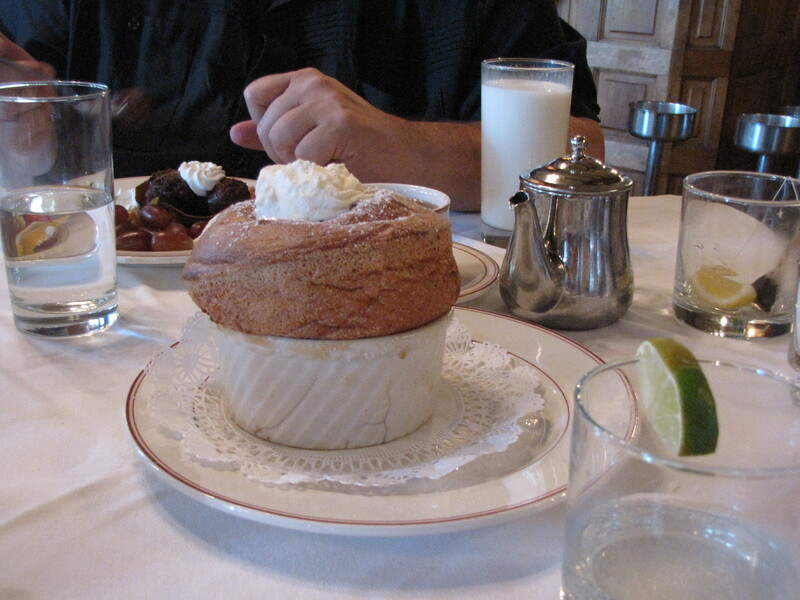 It evoked memories of other places we had visited around the world. Since the organization’s mission is to build positive connections between countries I guess that’s not surprising. If you enjoyed this post you might also like……. 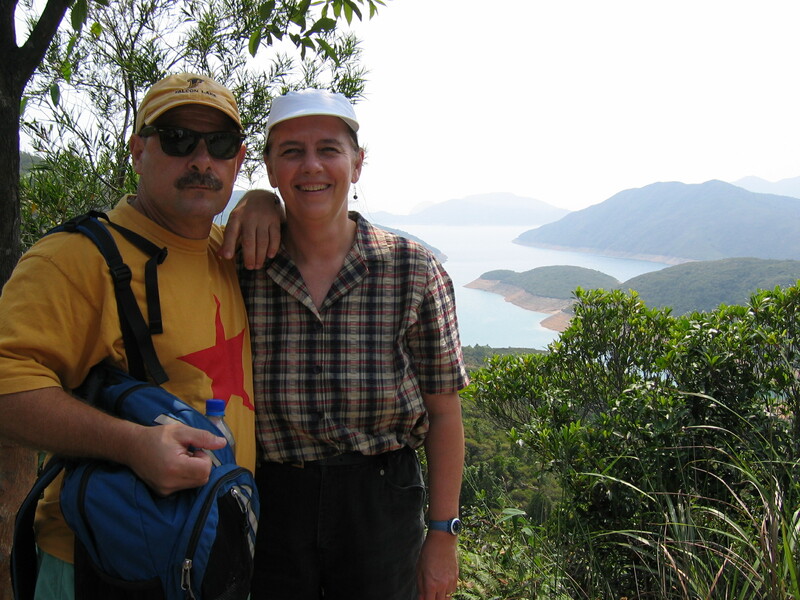 It has been about a year and a half since we moved back to North America from Hong Kong. 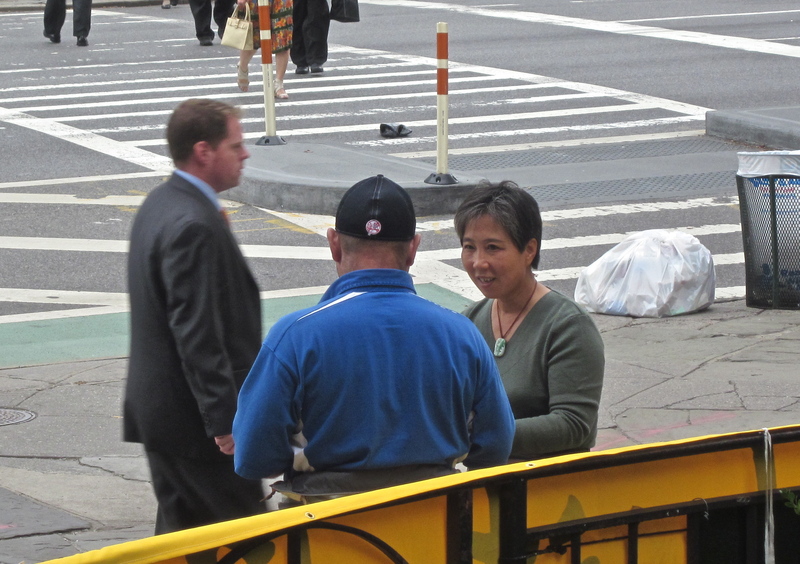 On our recent visit to New York City I realized there were many things about New York that reminded me of Hong Kong. Although the typical image of Hong Kong is a place of skyscrapers and traffic the city has lots of green space. There are plenty of parks and beautiful wilderness places to hike. 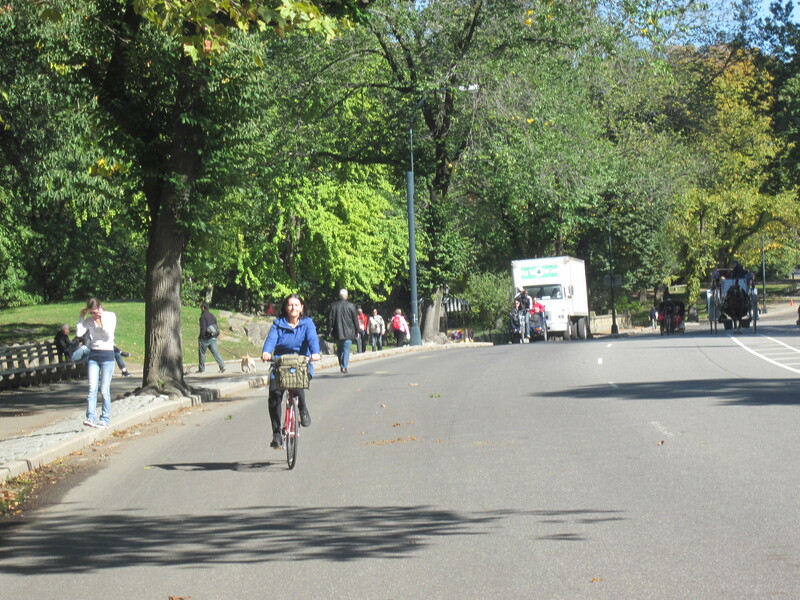 New York has preserved some lovely green spaces as well. 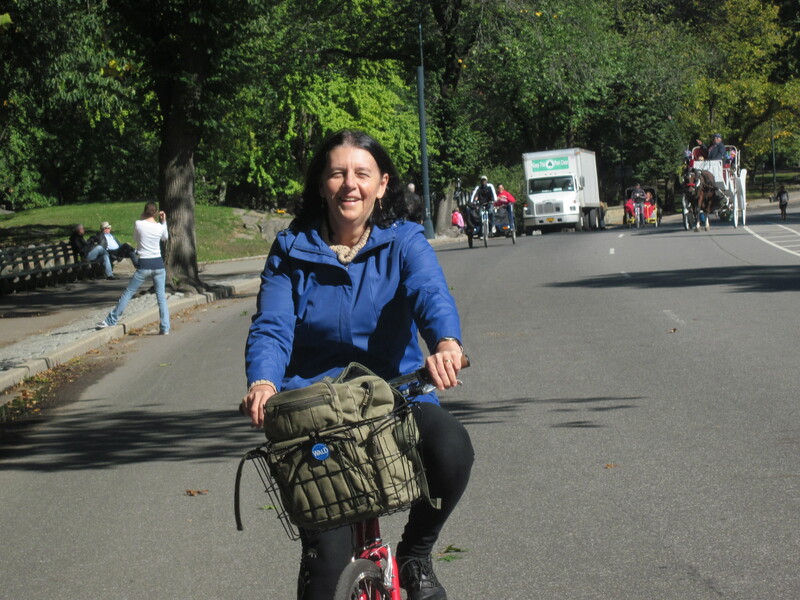 We spent several hours biking through Central Park. Right in the middle of this huge metropolitan city is a park that covers 843 acres and is 2.5 miles long. 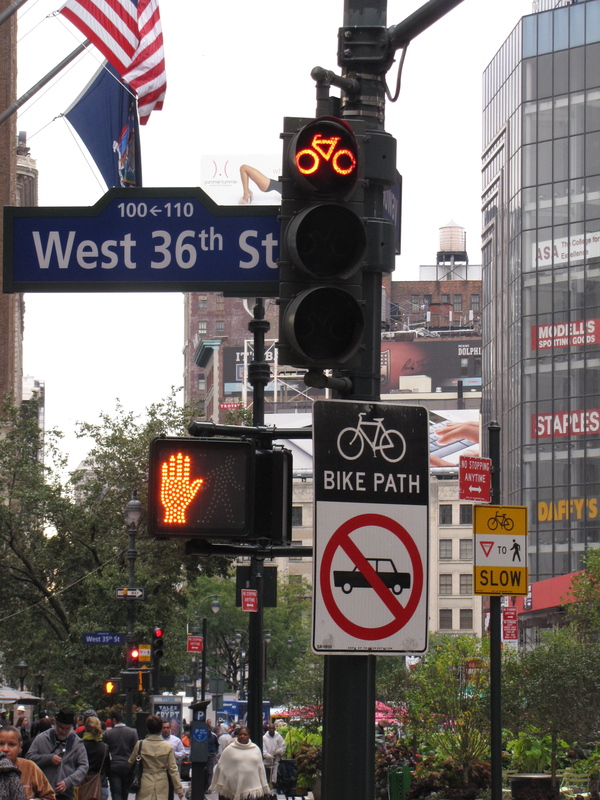 In both Hong Kong and New York people seem to pay little attention to street lights. They just cross the street in droves whenever they think they can get safely across. 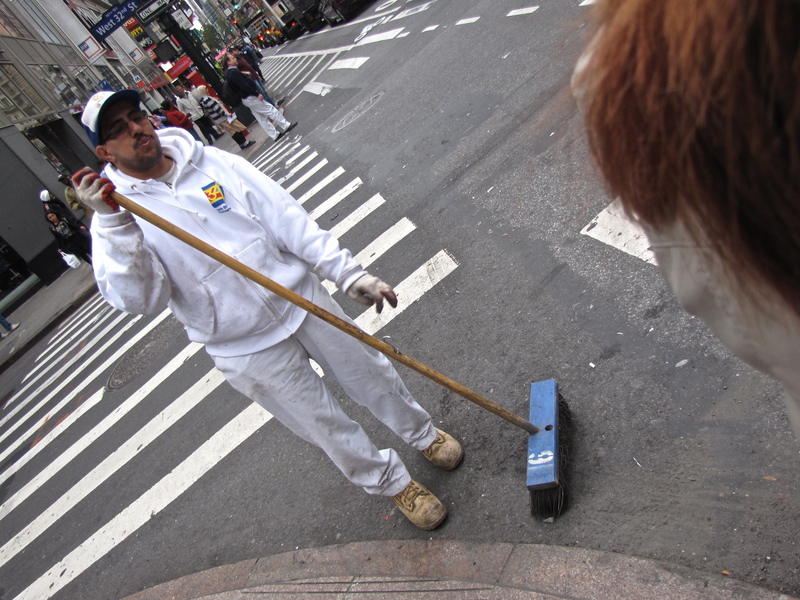 Our guide on one of our New York walking tours told us that jay walking is just an accepted part of life in New York City. It is in Hong Kong too. There were times in Hong Kong when I would look around in a train car and realize that I was the only Caucasian there. That happened to me a couple of times in New York too. 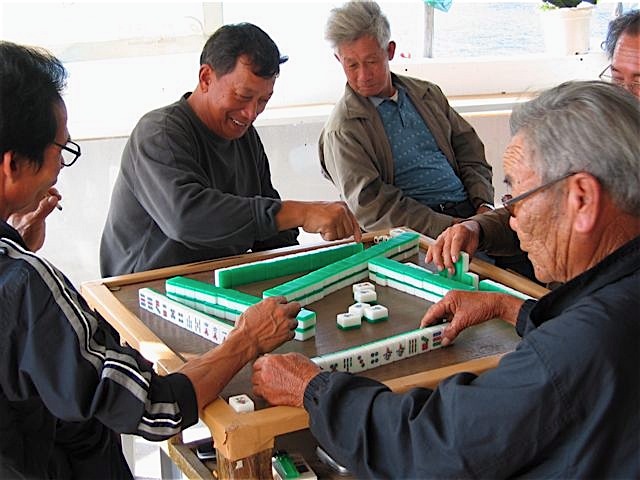 In Hong Kong you see men in parks playing mahjong. 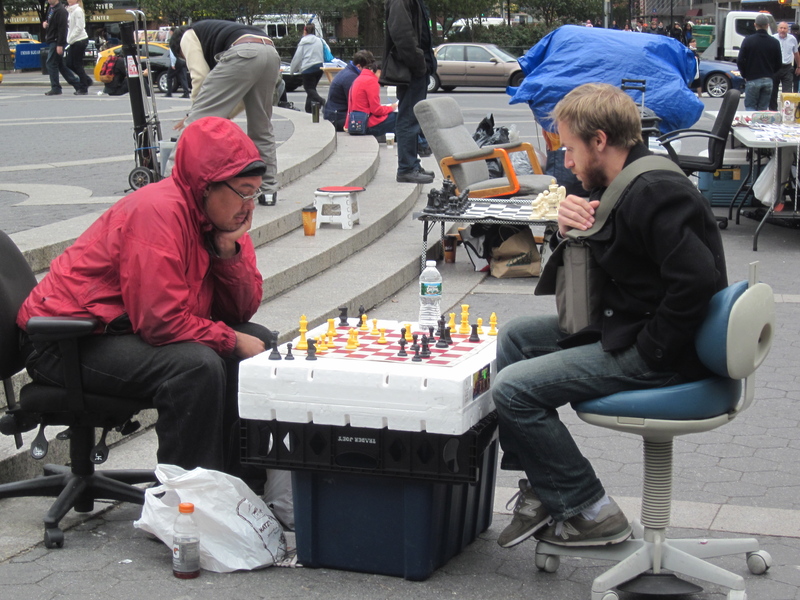 In New York they are playing chess. 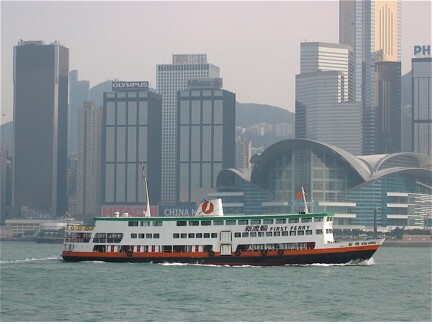 In Hong Kong ferry boats are still used daily for transportation. 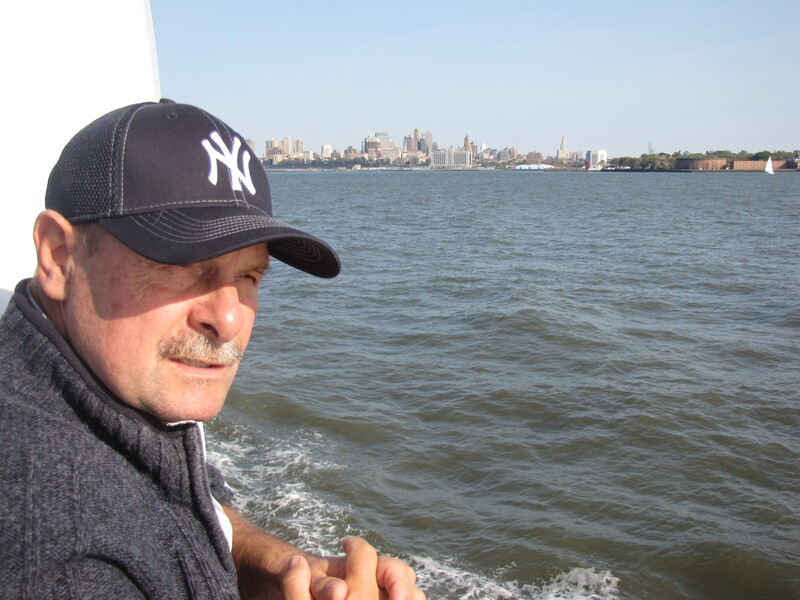 There are plenty of ferry boats to ride in New York too. 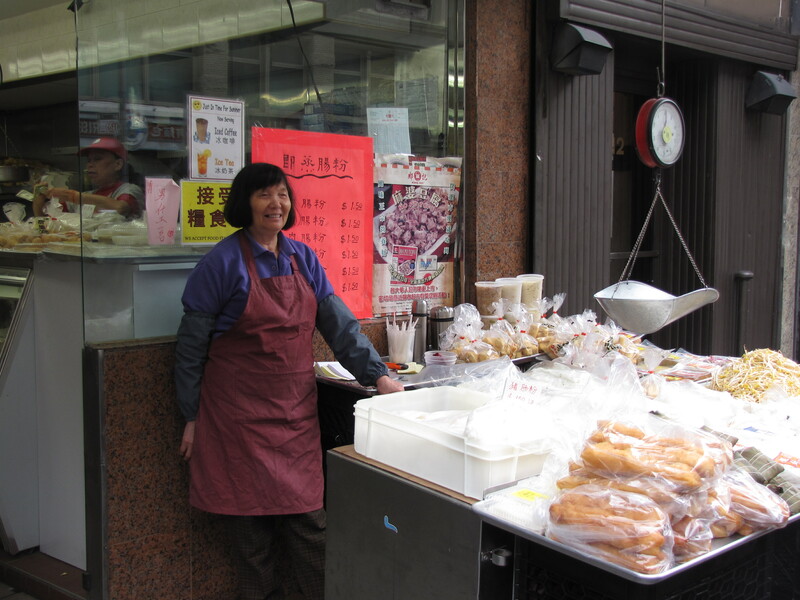 In Hong Kong when you are in a restaurant or coffee shop or shopping mall you can hear people speaking all kinds of languages- Mandarin, Cantonese, Korean, Tagalog and English. It is the same way in New York. We were sitting in a Starbucks just off Broadway and I heard Spanish, French, English,Korean and a language I couldn’t identify being spoken by people sitting around me. There is lots of construction going on in both Hong Kong and New York. 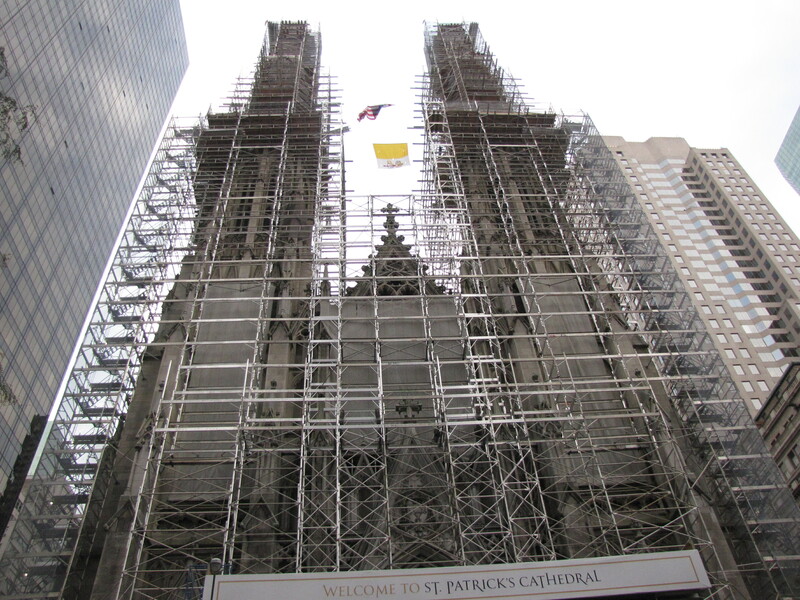 In New York they use steel scaffolding. 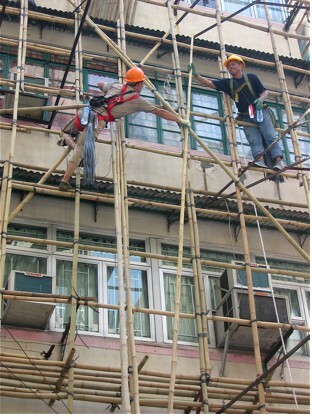 In Hong Kong the scaffolding is made of bamboo. Rent is very expensive in both Hong Kong and New York. 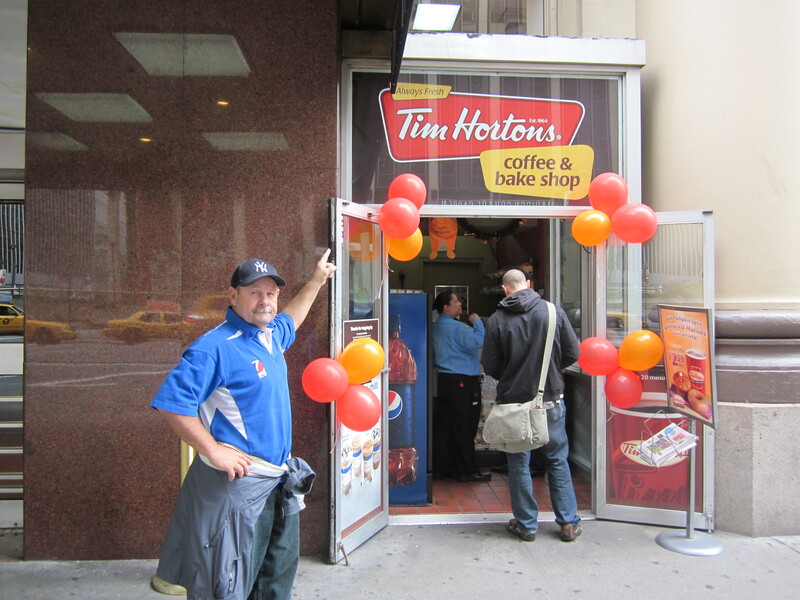 I found statistics for May 2012 that said an average two bedroom apartment in Hong Kong was renting for $2,800 a month and a two bedroom apartment in Manhatten was renting for $3,400 a month. In both New York and Hong Kong cars aren’t as popular as in many other cities. In Chicago for example 89% of people have access to a personally owned vehicle while only 50% of people in New York own a car and only 56 out of every 1000 people in Hong Kong own a car. The public transportation system is very heavily used in both Hong Kong and New York. In New York you board the trains after swiping your MetroCard. 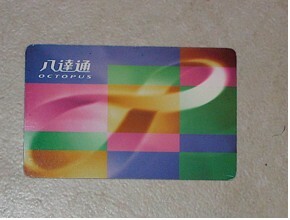 In Hong Kong you use an Octopus card. 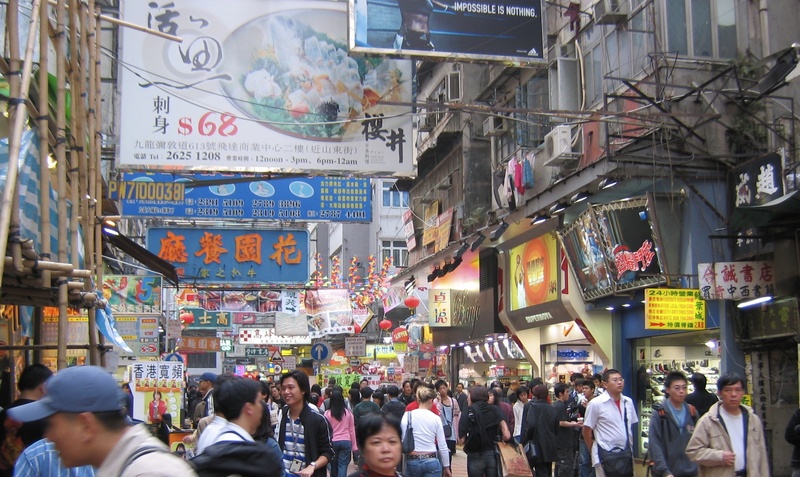 As I was walking down the streets of Time Square in the evening, the crush of the crowd reminded me of trying to make my way down the streets in the Mong Kok area of Hong Kong, the most densely populated place on earth. 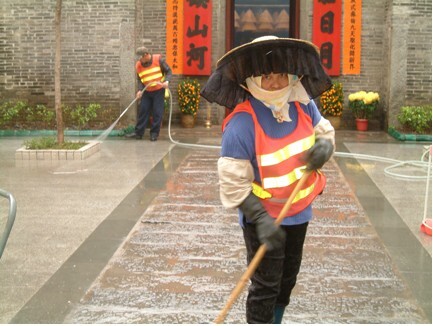 There are lots of street sweepers in both cities although they dress a little differently. and her New York counterpart. In Hong Kong restaurants offer every kind of food imaginable just like they do in New York. Both Hong Kong and New York have iconic statues. 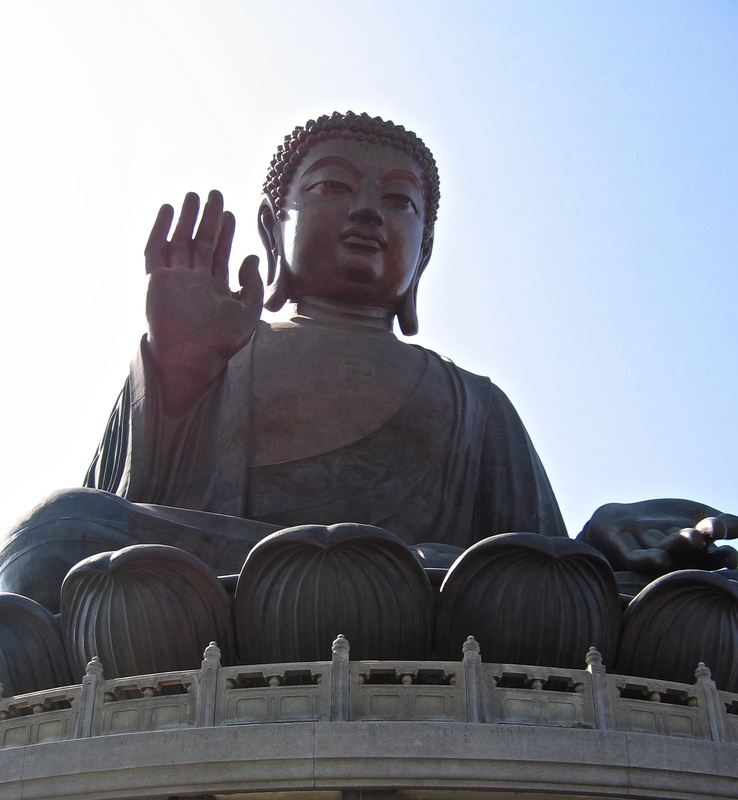 In Hong Kong there is the Big Buddha. 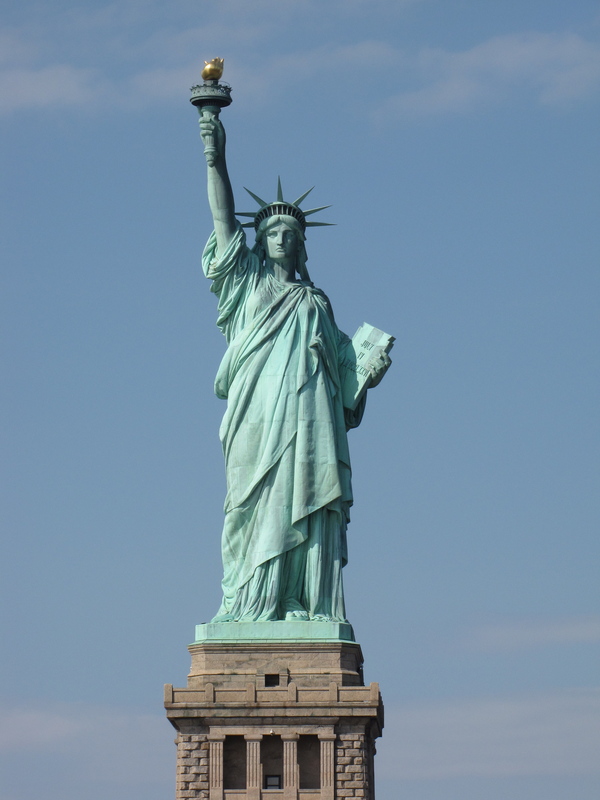 In New York it is the Statue of Liberty. Although I don’t know if I will ever get to visit Hong Kong again, being in New York City brought back some fond memories and comparisons with the city we called home for six years. 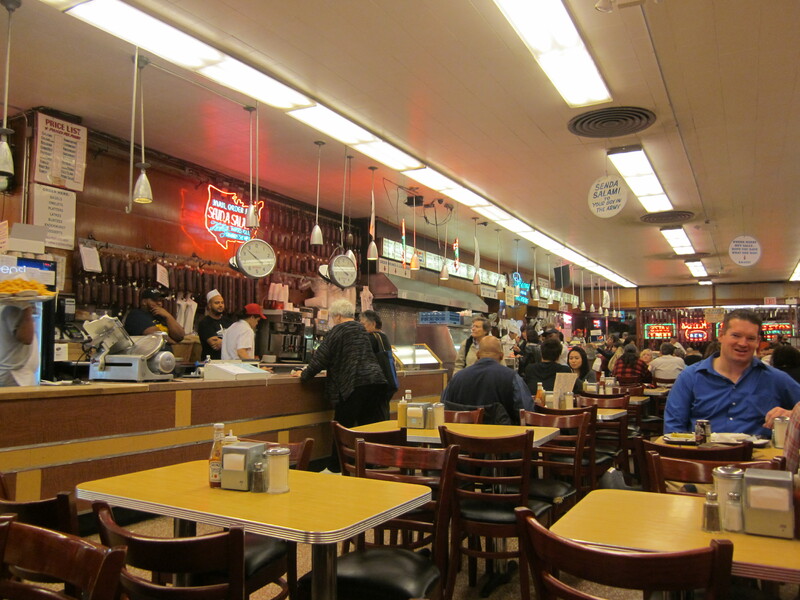 Meg Ryan, playing the role of Sally Albright, fakes sexual fulfillment in a most convincing way at one of the tables in Katz’ Deli in New York. It is a classic scene in the movie When Harry Met Sally. That scene has put Katz’ on the map. There is a sign in the restaurant marking the table where the scene was filmed. 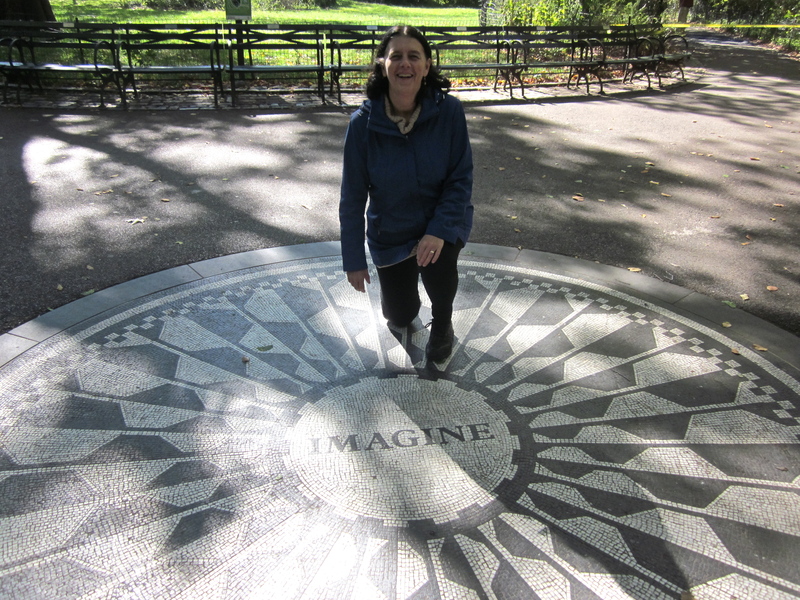 This ‘in memory’ plaque was on a park bench right beside Strawberry Fields the art piece dedicated to John Lennon in Central Park. The plaque in memory of Britt Marie Katayama begins with the words Imagine you at Peace . It alludes to Lennon’s peace anthem Imagine. 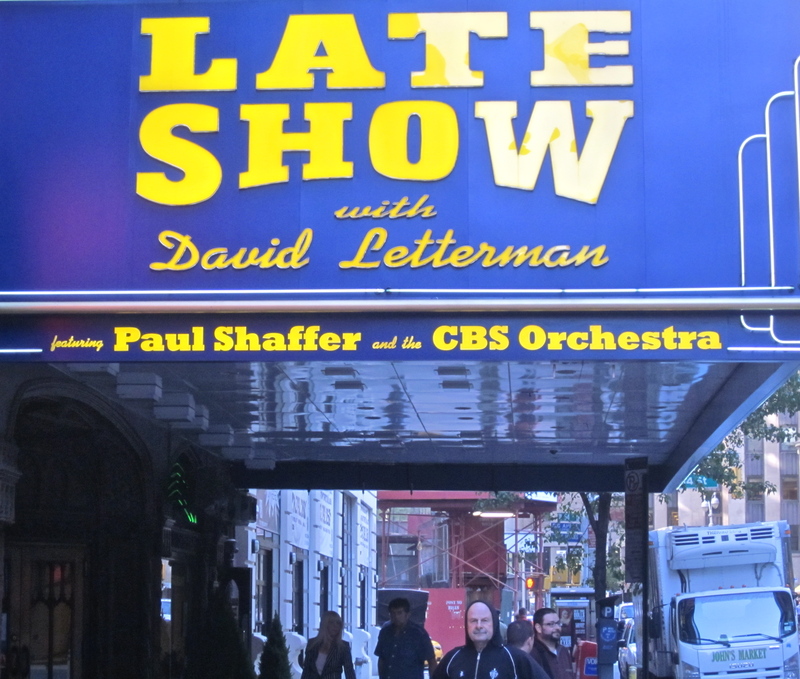 The David Letterman Show was in a filming hiatus during our time in New York but we went past the theatre which is its home and my husband Dave posed for a photo. 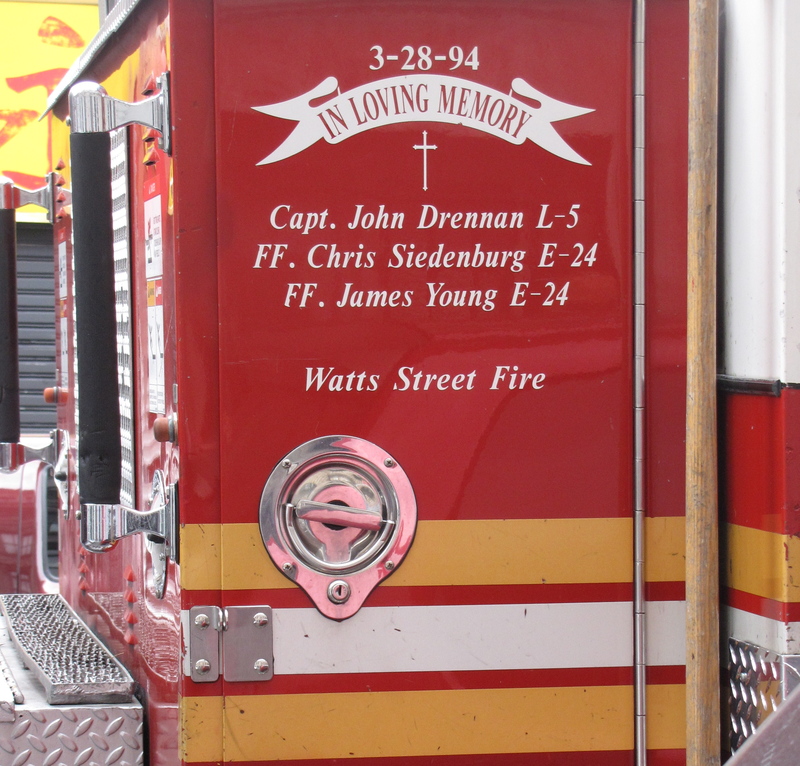 Most of the fire trucks I saw in Manhattan had one of these ‘in memory’ signs. 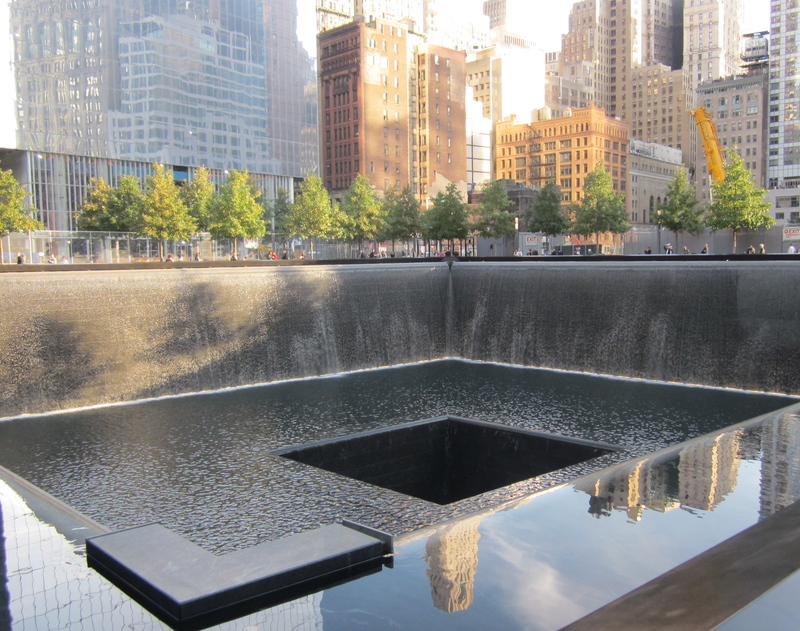 They featured the names of firefighters who died during the 9/11 rescue operations. 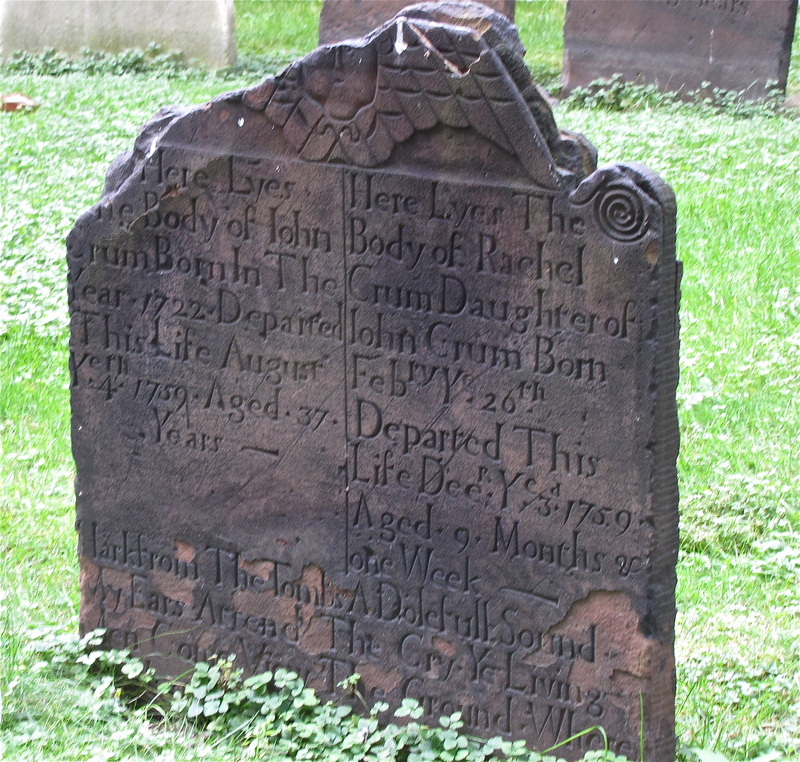 In the Trinity Church cemetery I took a photo of the grave of John Grum 39, and his nine month old daughter Rachel, who both died in 1759. 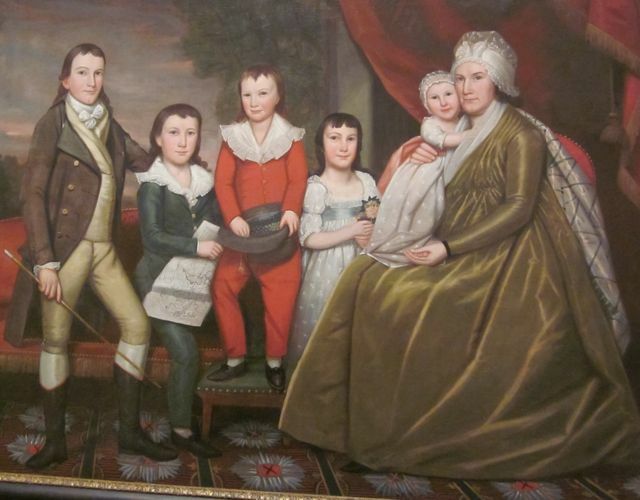 John died in August and his child in November. 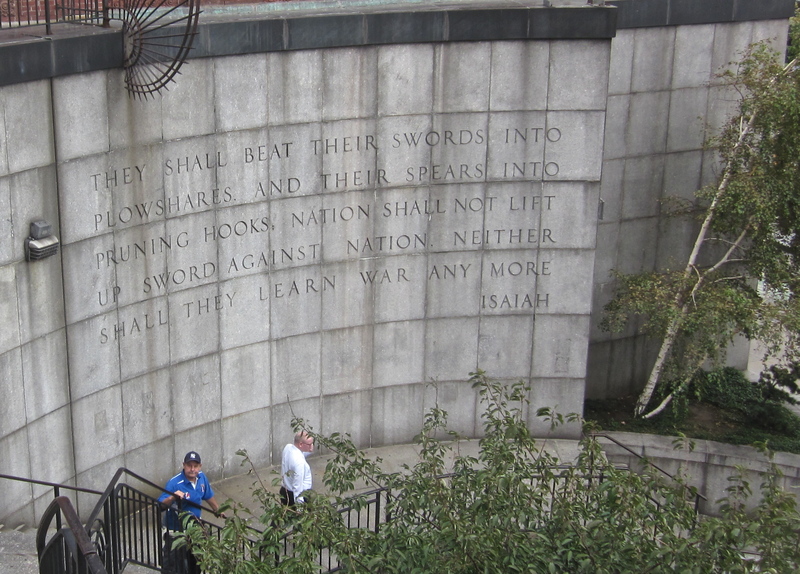 The words of a hymn written by Isaac Watt in 1709 are engraved on the bottom of the tomb. 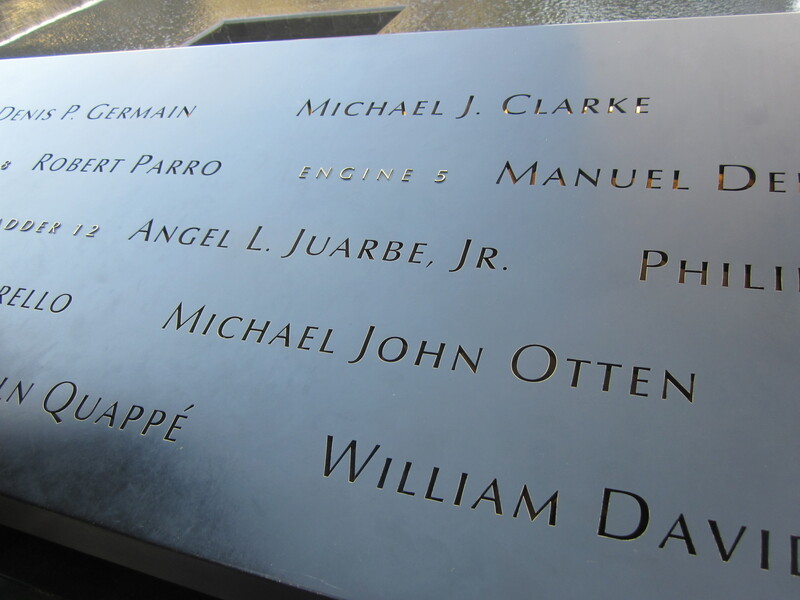 Names of the firefighters on Engine 154 who died doing rescue work at the Twin Towers during 9/11. 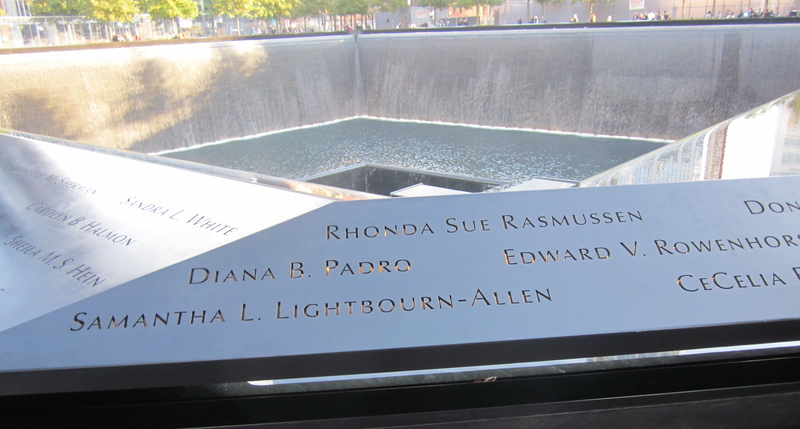 Their names are engraved in the steel railing around the memorial pools at the Ground Zero site. This is the table where the Canadian delegation sits in the United Nations assembly. 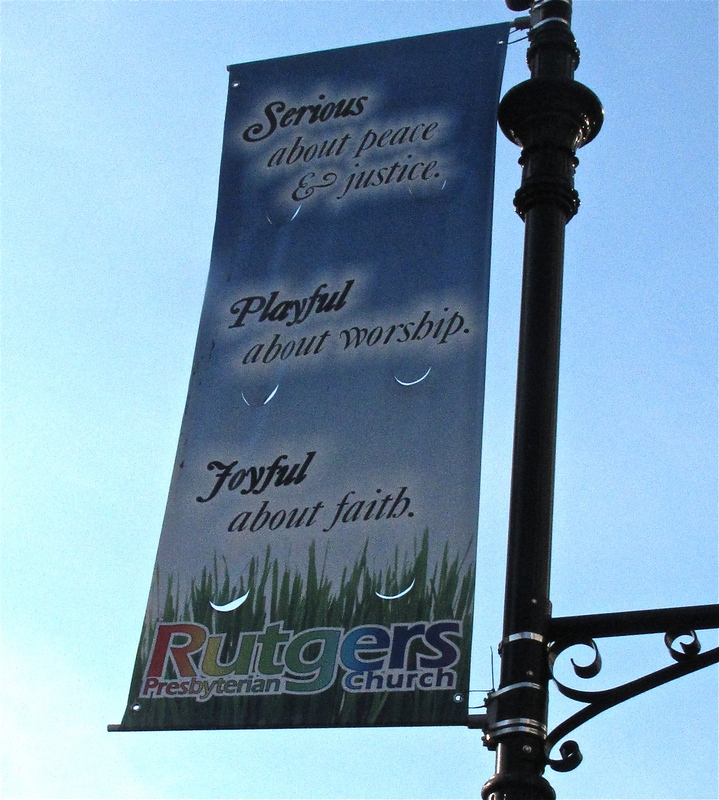 This street light banner for Rutgers Presbyterian Church makes the congregation sound pretty inviting. Serious about peace and justice- Playful about worship-Joyful about faith. 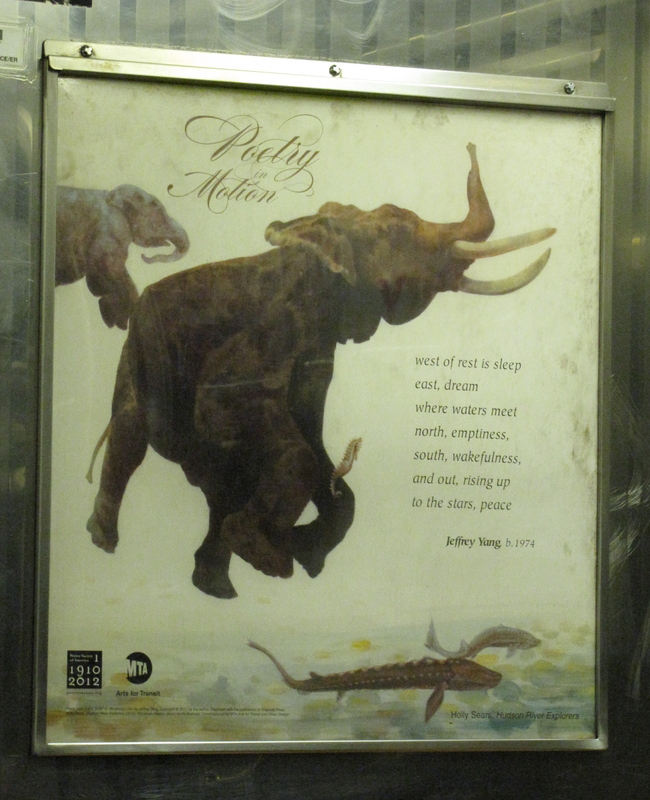 The New York subway system has an initiative called Poetry in Motion. They post a different poem every month on their trains. 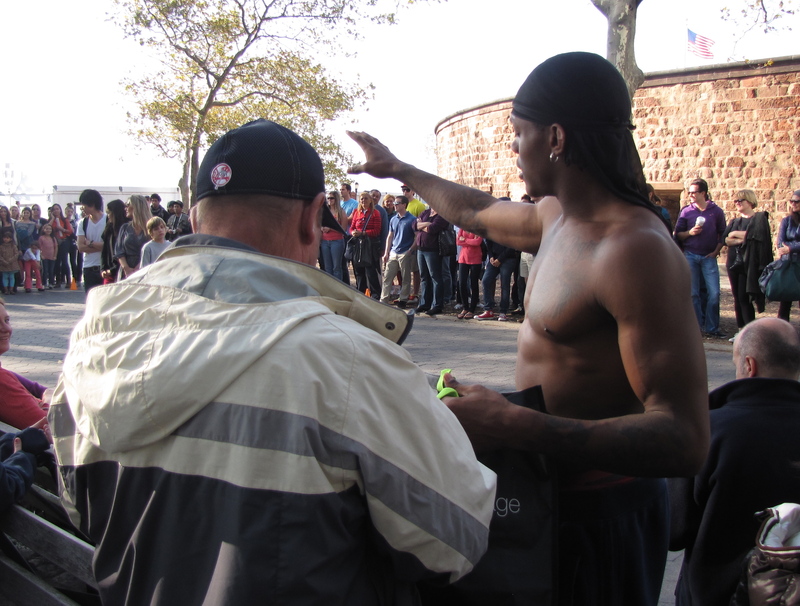 In October during our visit to the city they were featuring an untitled poem by Jeffry Yang. 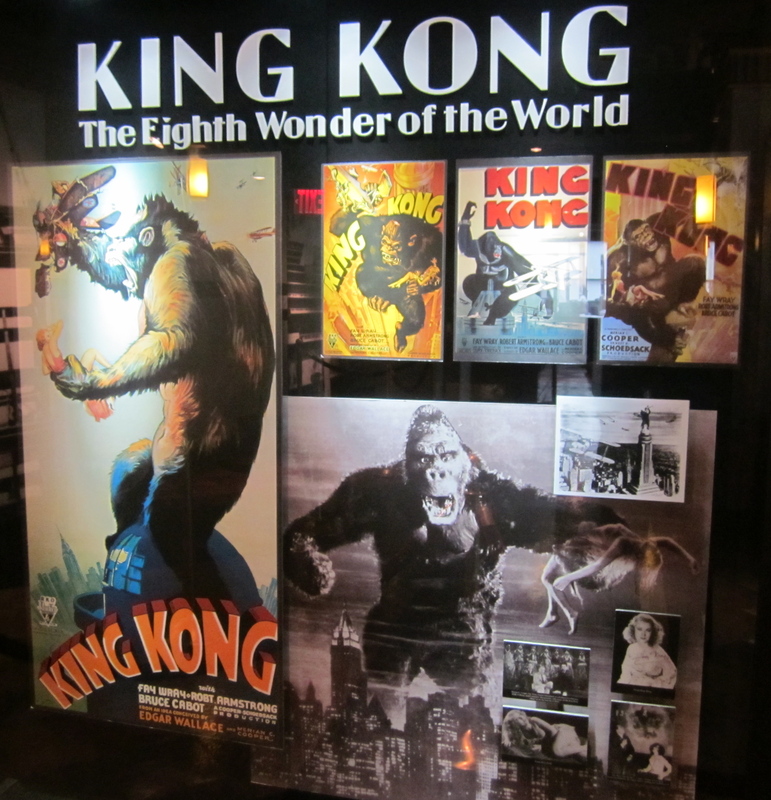 It read…..
King Kong poster in the Empire State Building. In the 1933 movie King Kong the giant ape who is the main character, climbs to the top of the Empire State Building and falls to his death after being attacked by airplanes. 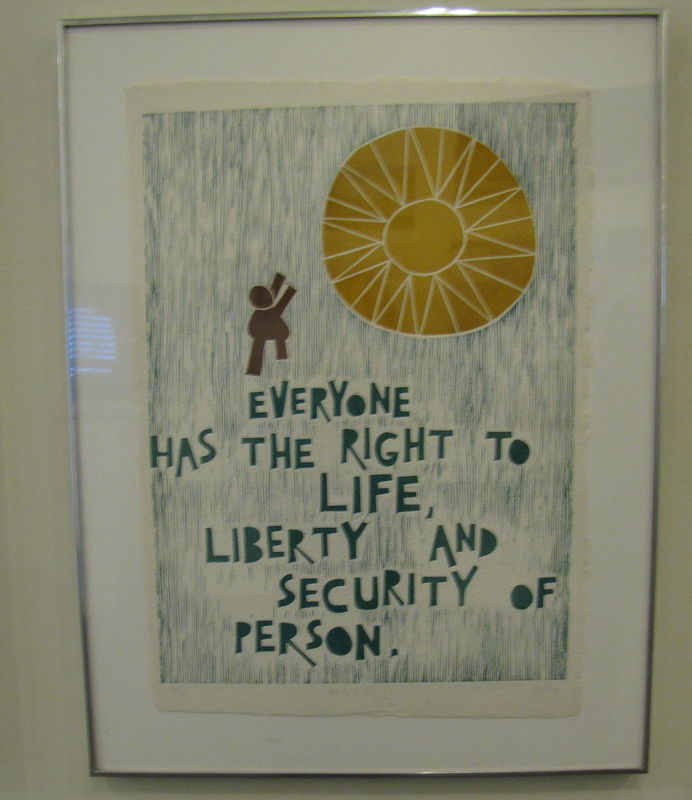 One of the art pieces in a display at the United Nations that catalogues the 30 articles in the Universal Declaration of Human Rights. 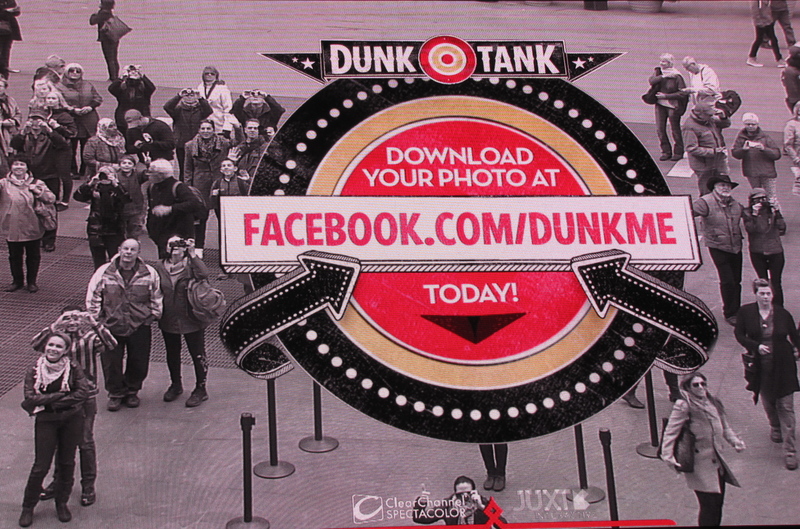 If you enjoyed this post you might also like……..
What the f__________ are you tourists doing here? Speak softly. Be considerate. Keep your feet off the seat. 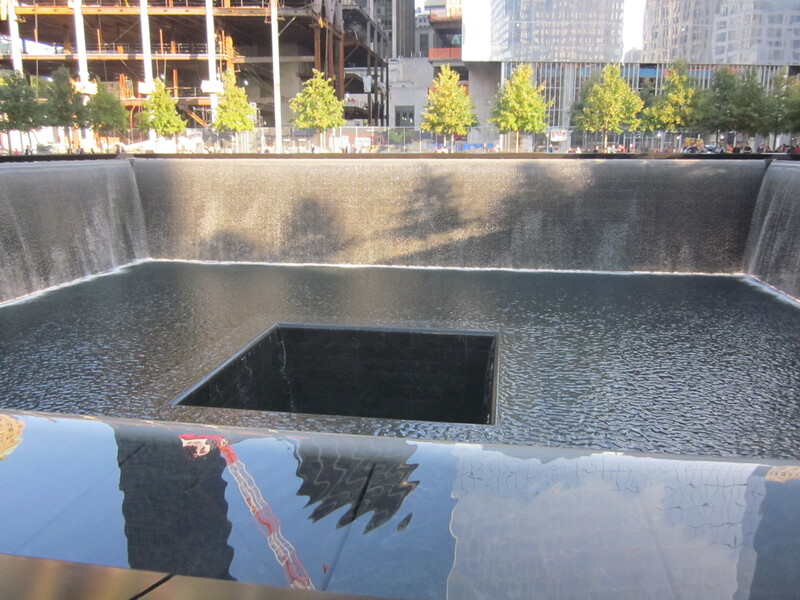 My husband was crying when we visited the Ground Zero Memorial site. Theatres should have four times as many bathrooms for women as they do for men. 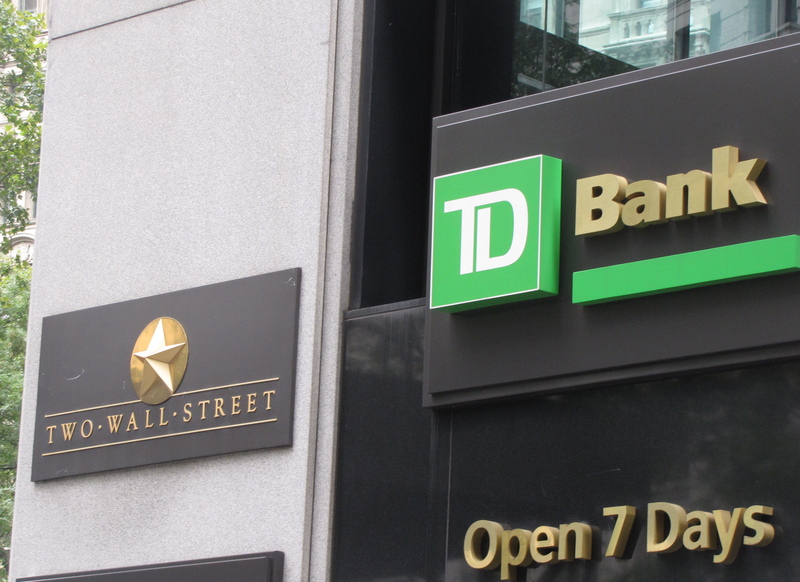 -woman standing in line with me to use the washroom during the intermission of the Broadway musical Wicked when the announcement is made that there is one minute to curtain time. There were still a dozen women ahead of us in the line. 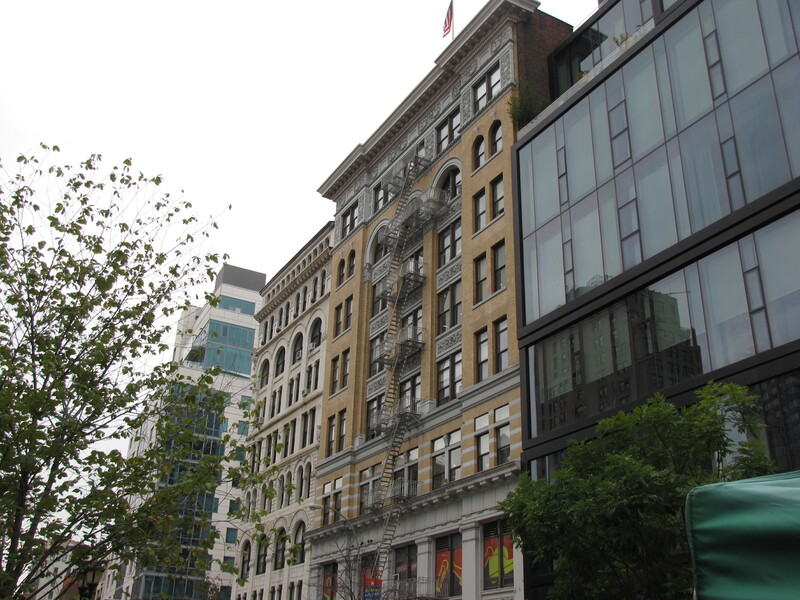 That apartment building is where Nicole Kidman and Keith Urban live. They have an elevator for their car so they don’t have to get out of their vehicle to go up to their apartment. 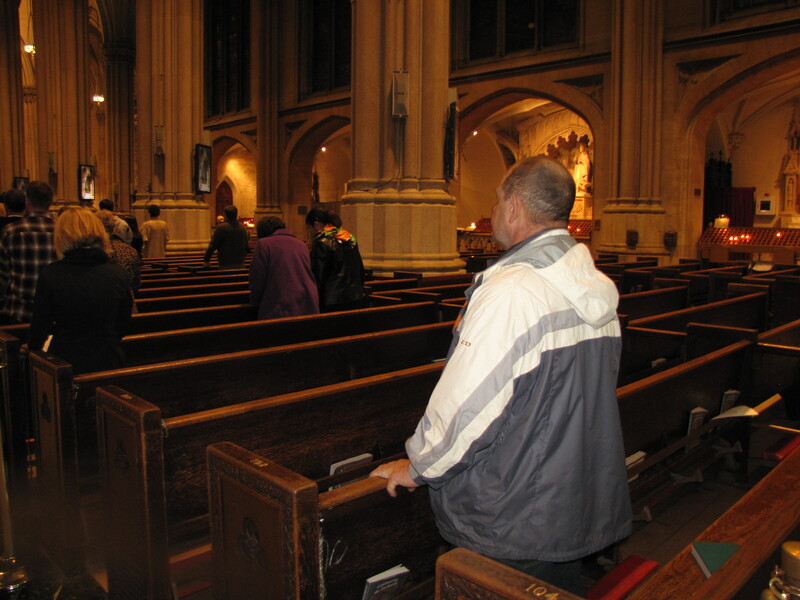 I confess to almighty God and to you my brothers and sisters, that I have greatly sinned, in my thoughts and in my words, in what I have done and in what I have failed to do. Are people born wicked or do they have wickedness thrust upon them? You can come a little closer white people. No need to be scared of us. Remember we have a black president now. His name is Obama and he wants change but we want bills. 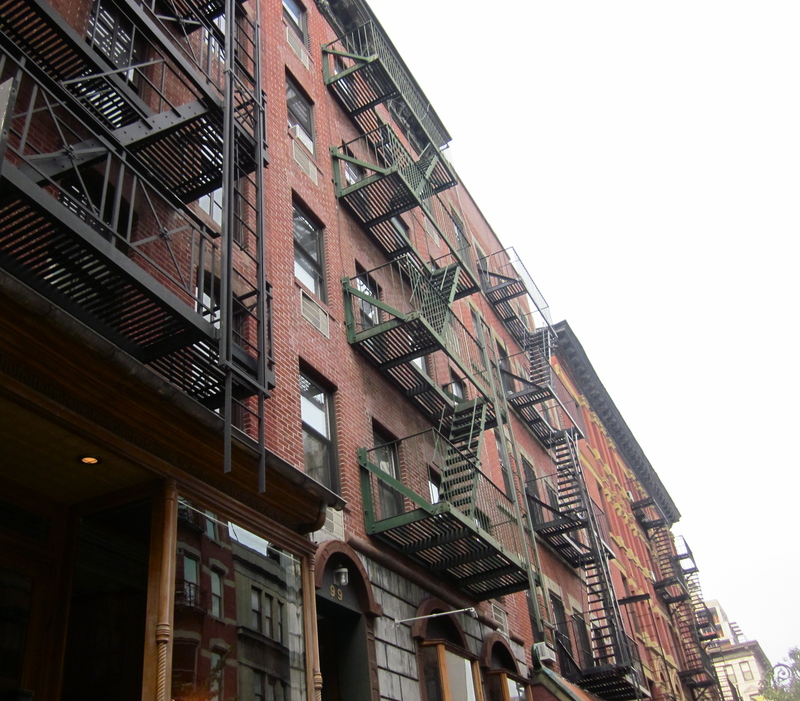 In 1898 this tenement building was home to twenty families each with a 325 square foot apartment and on the main floor there was a saloon. All the tenants and the saloon shared one spigot for drinking and washing water and it was located right beside the four outdoor toilets. 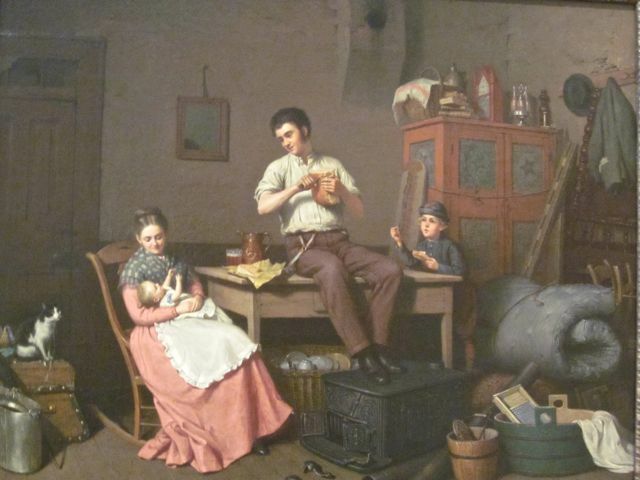 The average wage was $10 a week and the infant mortality rate was 30%. 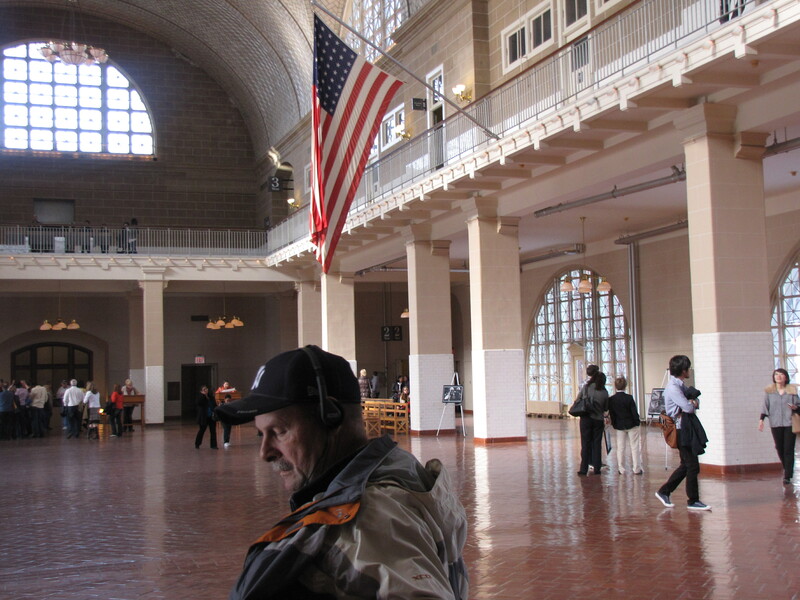 I left Europe after a failed marriage and entered the United States on a visitor visa. I soon realized if I wanted to stay and become a citizen I would need to get married. A friend set me up with a guy who seemed really nice but we had only been married a couple of days when I realized he was insane. He truly had mental problems and I was scared of him. So I kicked him out and got a divorce as quickly as I could. The second time I chose more wisely, a gay guy who was from Prague. 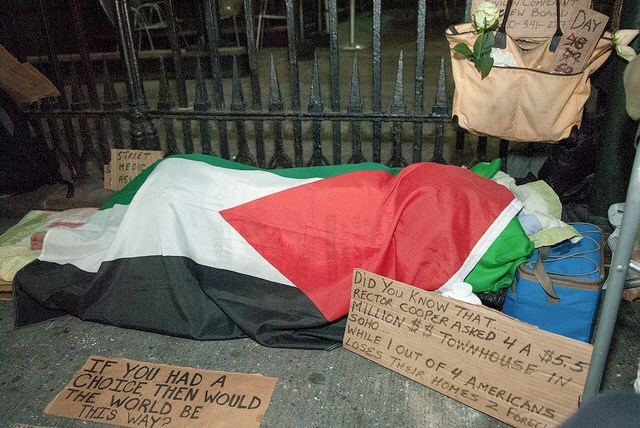 He had American citizenship and needed a place to live while he went to university. It worked out well. We got married. He moved in with me. We were together for a couple of years. I got my citizenship. He got his degree and we got a divorce. Then he went back to Prague to look after his aging parents and he never returned. We have lost touch. I love living here in the United States. I have been able to get a college degree and now I have a steady job and income. You wouldn’t believe how many people I know who got their immigration papers by marrying someone and divorcing them later. Everyone does it! 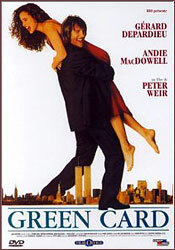 Just like in the movie Green Card. The United Nations was not created to take humanity to heaven but to save it from hell. 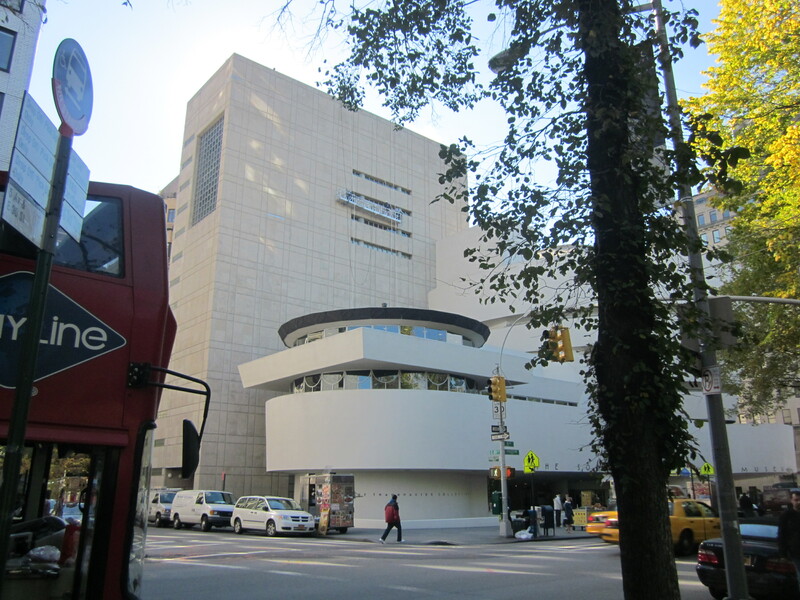 Visit to the Museum of Modern Art in New York- Are All Artists Troubled? In New York we had a very good time.